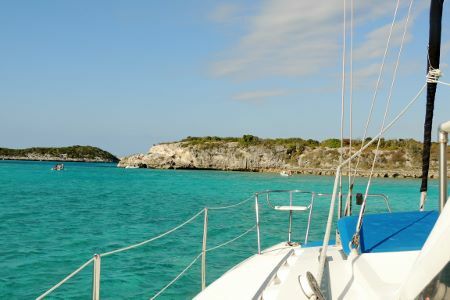 April 23 to 26- We left Nassau and headed to Allans Cay in the Exumas on Saturday the 23rd. This update will include several days since I don't know when I will be able to upload the website. However, if I don't write it as I go then I know I won't update it near as much. 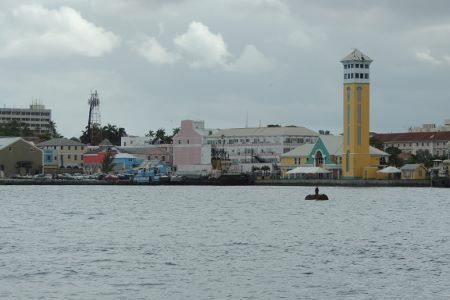 I called Nassau Harbor Control as I left and let them know we were leaving to the East and the next port of call would be Allans. 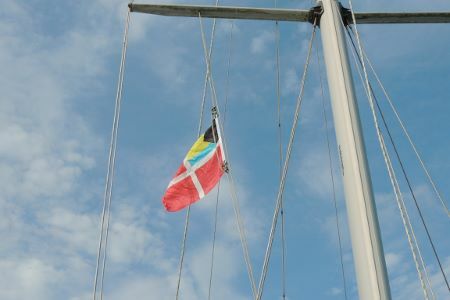 They wished us a safe voyage and we were off - once again the wind was fairly close to our "nose" but it wasn't like a few days ago. Bill and I had some sail up which helped. Mile Marker motored. About 2/3rds the way across, Kim called and said the engine just quit. We had talked about their engine varying in RPM not 15 minutes before by about 300 rpm's. I let them know that I thought it was probably the secondary fuel filter (the little one on the engine) because it is the finest filtering and small. Well, Mike was on it very quickly and by the time we all joined up again he had it replaced. Bill had also made a suggestion to switch tanks. So it could have been the filter but then again it could be a partial clog in the pickup tube. I had that happen about 10 years ago. Regardless, they took care of it and no real help from us. Natural Sailors each one of them! 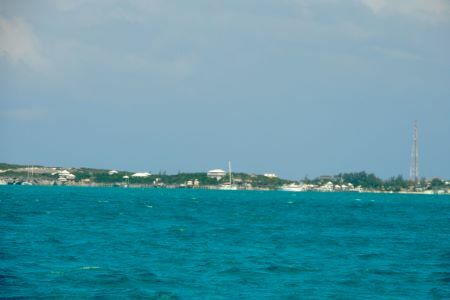 As Allans Cay came up we saw a bunch of boats anchored here. To the left of this picture are a bunch more. This is always a favored anchorage. Even the small boat to the lower left was anchored and checking out the local attraction. 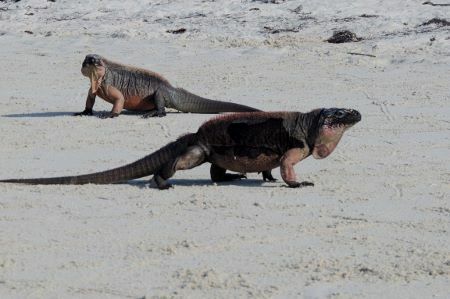 Iguanas! 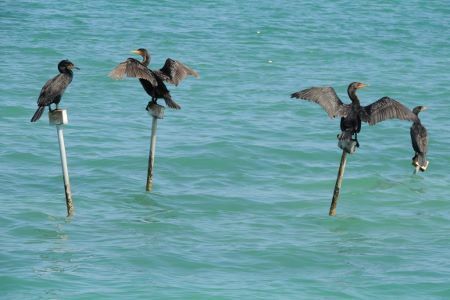 I think they all listen to Madonna's song too much and seemed to strike a pose for everyone they see. Either that or they are trying to intimidate you into feeding them something. You are supposed to but if people didn't do it then why would they all run to the beach every time they hear a dinghy engine or see people? 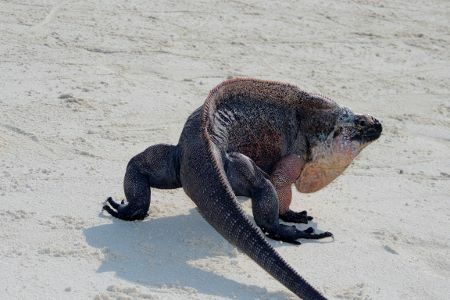 I just thought I would give you a few pictures of some of these "beasts." 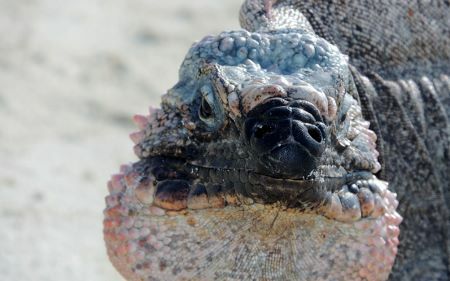 Only the face a mother could love! This is a mound of rock cruisers have built. I didn't go up there but I guess it has meaning to many people. 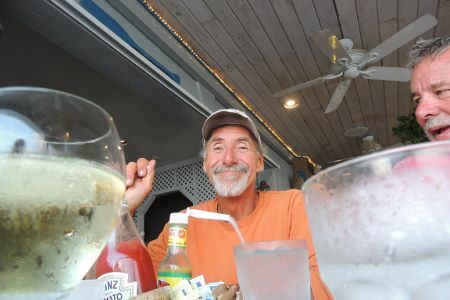 We then headed over to Mike and Kim's boat (Mile Marker) and took a dish along with some beverages. As always, we had a wonderful meal and more importantly great company and conversation. 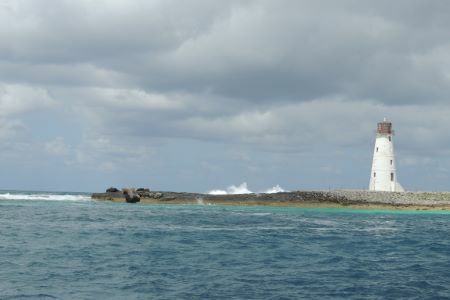 This the the most beautiful anchorage so far and most importantly, it is one of the main attractions we came for. 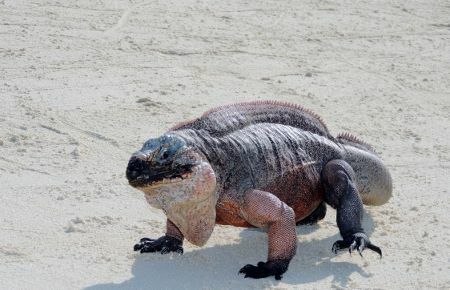 We will probably spend about 7-8 days in the Exumas hitting different islands each day with very little time between them. 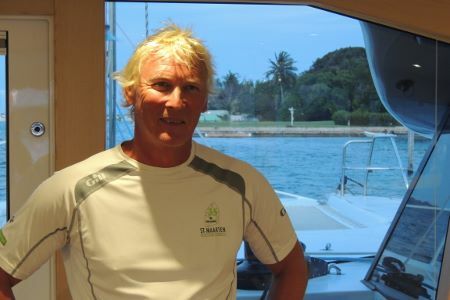 Hopefully, we will being doing more sailing than motoring! We caught a picture of Sissy and Deb and I can't figure out this morning why Kim wasn't in it. Well, there is another opportunity today or tomorrow! I'll start getting more people pictures too so you know we are actually all alive! 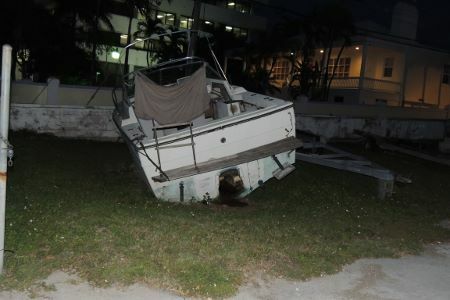 The next morning I cleaned off some of the diesel scum from the hulls of the boat we picked up in Nassau Harbor. 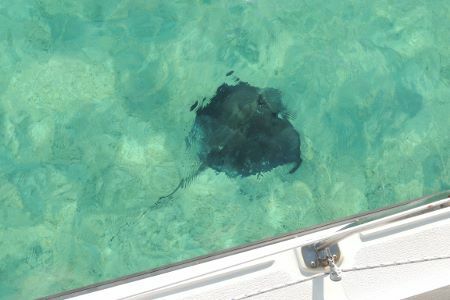 Afterwards I spotted this Ray swimming around looking for something to eat on the bottom. Below right you can see there were quite a few people on our side of the anchorage. That big fishing boat came in late and anchored between me and another Cat. The other Cat left early this morning and I imagine it was because they were pretty close. Last night was interesting with light winds because boats were in every direction but nobody hit evidently. This is what it looked like this morning from the beach view of the 3 Gemini's. And another picture. 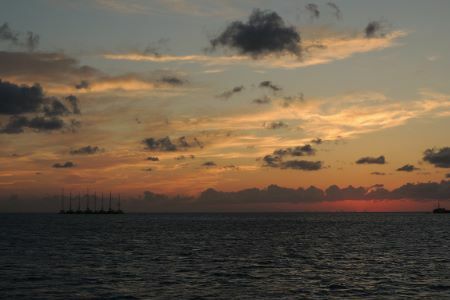 However the real pictures are below and you can get an idea of why this is such a beautiful anchorage. 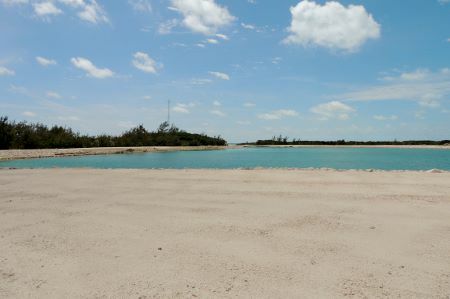 Clear, very clear, water along with a wonderful sand beach and a palm tree give you everything you need. Life is good here about Freedom, Pisces, and Mile Marker! Sunday, some boat chores had to be done and then I took Bill out dragging him behind my dinghy for about an hour and a half. He was able to find 2 conch and a Peacock Flounder. It was an enjoyable time. Bill is an excellent swimmer, diver, and of course a good fisherman too with a pole spear. Too bad lobster season is now closed. He saw a monster. 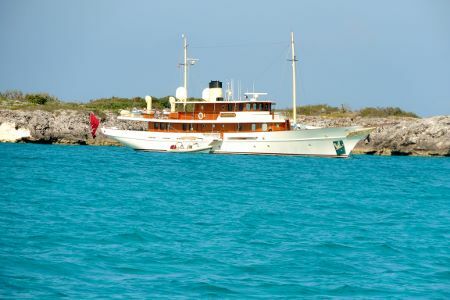 We then headed down to Normans Cay. We elected to go to the inside anchorage over by the DC-3 which had been crashed in the drug years. 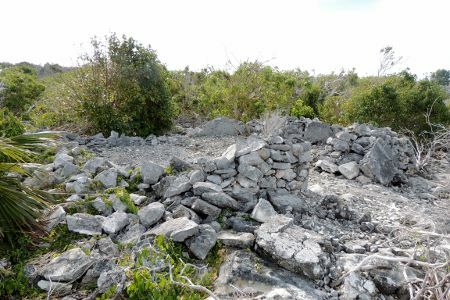 One of the things I noticed immediately was these mounds of sandy coral piled up on the island. Obviously they were building something but we didn't know what. The next morning, we walked over to the restaurant (longer walk than last time since the airport is now fenced off) and ran into some workers. They are building a new marina, lengthened the runway and fenced it all off, and building a number of multi-million dollar houses. 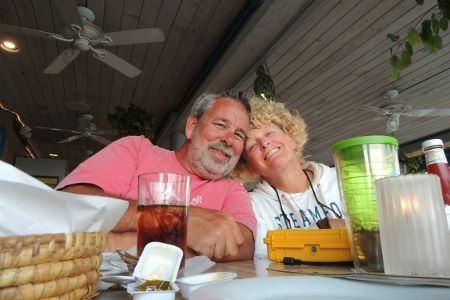 One thing I promised Deb before we left is we would go to Normans and have lunch. We had some good memories from 2008 we wanted to see the place again. 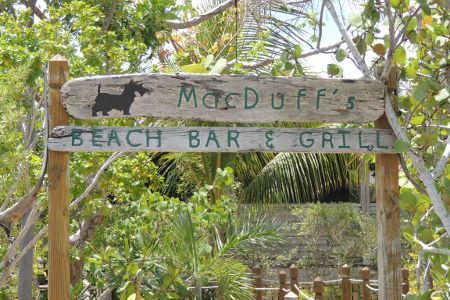 MacDuff's was the original name of this development and they kept the name for the Bar and Grill. 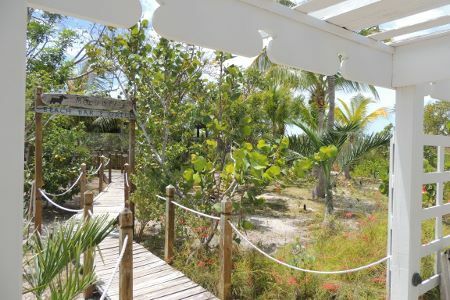 Now the cottages and "resort" is called Normans Cay Beach Club. It was fun although the walk from the east anchorage around the airport wasn't as much fun for Deb. We got there and then found out they would send a Golf Cart if we had called them on 16. So, we were destined for a ride back. We all had wonderful food but I will warn you if you want to eat here, bring you wallet, credit card, and also be prepared to mortgage your boat. Lets just say that when you don't have volume of people, you have to charge quite a bit more! Regardless, we enjoyed it and Deb and I split a wonderful Pesto Pasta. 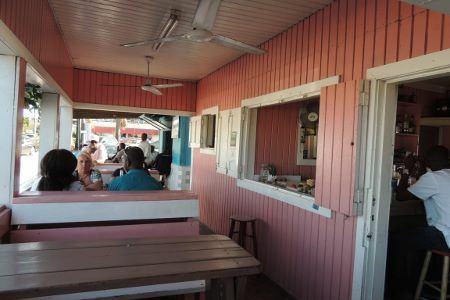 This is a picture of the bar area and the picture below is a sample of the outside area with nice seating. 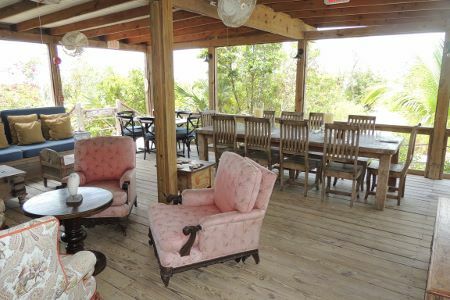 Unfortunately, Beth and Stephen are no longer there and this was sold to another investor. 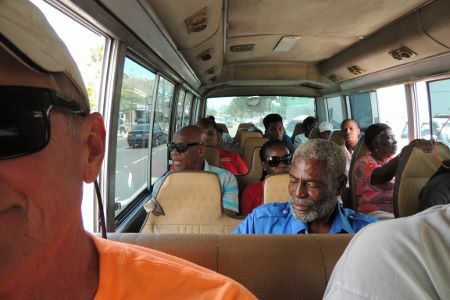 That probably explains the new pricing too but the pricing may be in anticipation of people with a lot more money than we have arriving at the island. 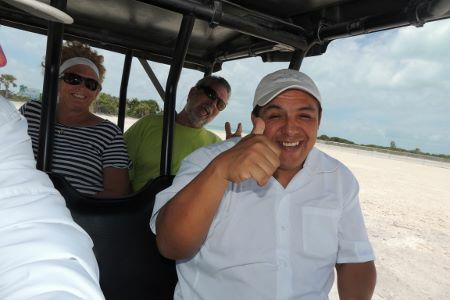 The ride back on the golf cart was provided and the Chef was the driver. Nobody but us were there for lunch so I guess he had the time to drive us back. That is when I found out that he had made the pasta from scratch - not hard but it is time consuming and it explained why the pasta was so tender and good. Then I asked him about the pesto and if it was something he got from a supplier - the answer was no, he made that too. Again, not hard but I was a bit surprised. Then he told me that his secret ingredient was to add a little spinach to the pesto too, in addition to the basil, because it gave it more color. I can't wait to try that myself when I get back home and get my basil growing again. 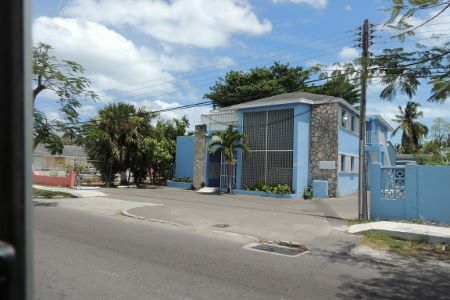 This is a picture of the drug house of a drug lord who ran the operations here. I am going to pull some text from my old 2008 log to provide you some details. 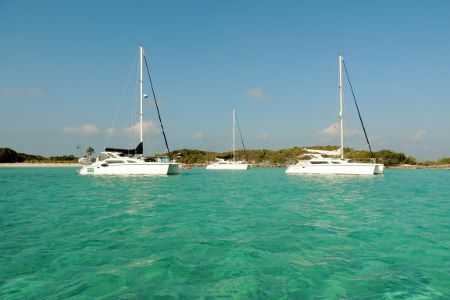 "Normans Cay (remember, it's pronounced Key) gained its notoriety during the late 1970's and early 1980's when it was used as a base for a very profitable cocaine smuggling operation. 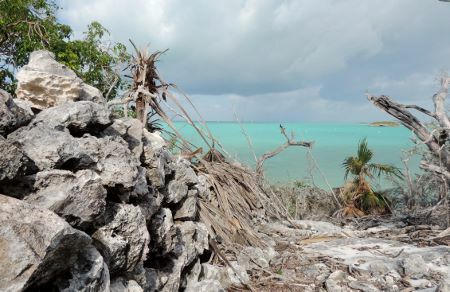 The only reminders are the bullet holes in some of the buildings on the south end of the cay and the airplane that rests in the anchorage." 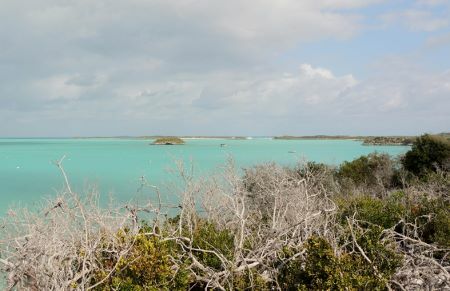 quoted from The Exuma Guide by Stephen J. Pavlidis. 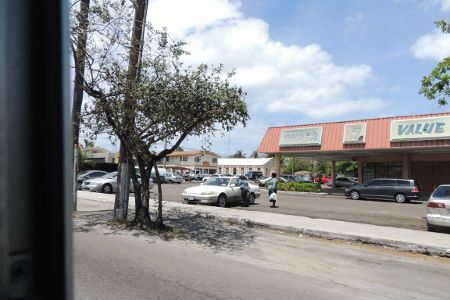 Pavlidis further writes, "In January of 1979 a newly registered Bahamian company called International Dutch Resources Ltd. bought half of the 650 acre island. 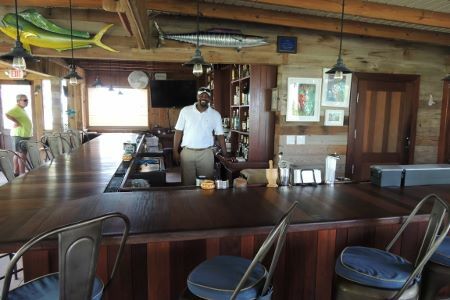 The $900,000 purchase price included the old Norman's Cay Yacht Club with its dock, airstrip, grocery and liquor store, and 10 rental units. 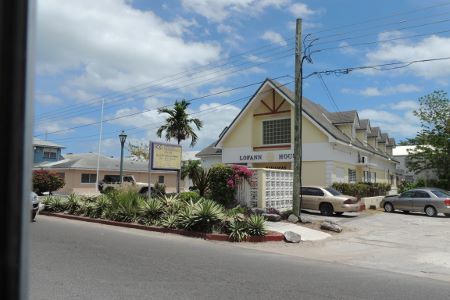 A Columbian of German ancestry, Carlos Lehder, was the controlling shareholder of International Dutch Resources Ltd. Lehder first appeared on Norman's Cay in 1977 and shortly thereafter purchased a villa. 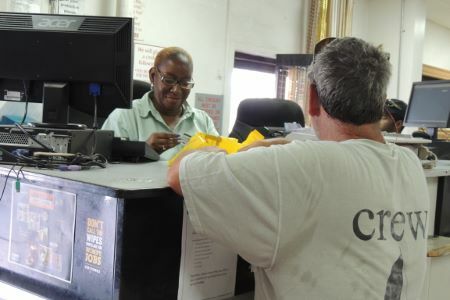 He systematically began purchasing other properties, threatening and intimidating when he could not get his way. 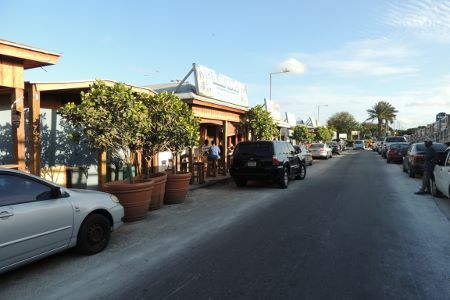 After he purchased the marina and airstrip he sank over $5 million into renovations, lengthening the airstrip and enlarging the dock. He had already been smuggling Madellin Cartel cocaine from Norman's since 1978 to airstrips in Florida and south Georgia. 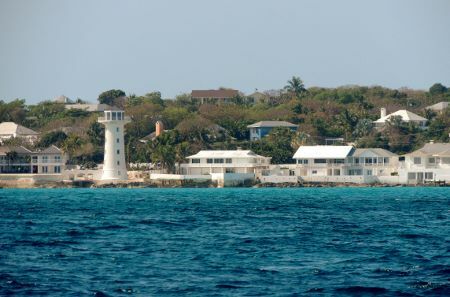 Boaters and visitors to the cay were discouraged, often chased away by gun toting guards. 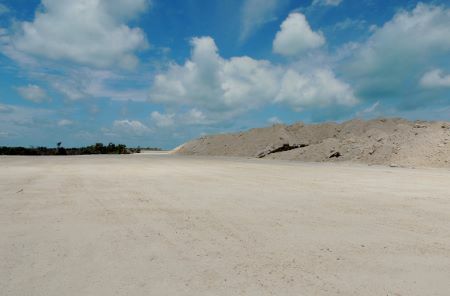 The airstrip soon became a hub of activity and aroused suspicions." 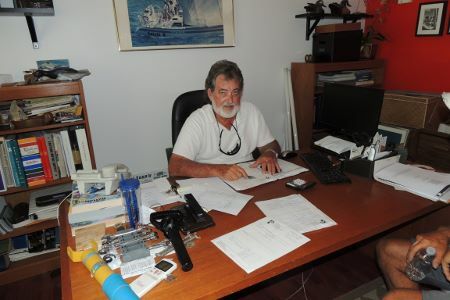 "The DEA organized a task force called Operation Caribe and targeted Carlos Lehder. A September 14, 1979 raid by Bahamian police officers netted 33 Germans, Americans, and Colombians. 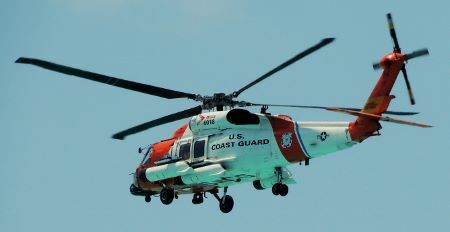 Lehder was apprehended attempting to flee in a small boat. Lehder was released uncharged after he turned over a suitcase that is said to have contained $250,000. 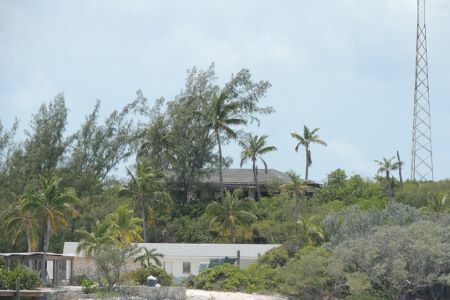 A DEA official stated that Lehder not only owned Norman's Cay, he owned "... the whole damned country." The DEA began to choke off Lehder's cash flow by arresting his pilots and confiscating his shipments. 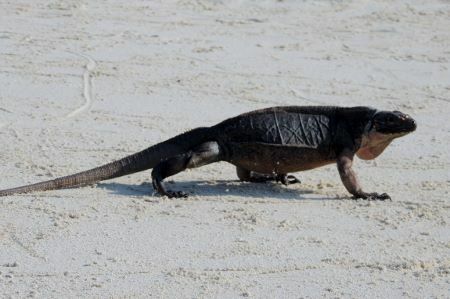 By 1983, Lehder had seriously curtailed his activities on Normans Cay. 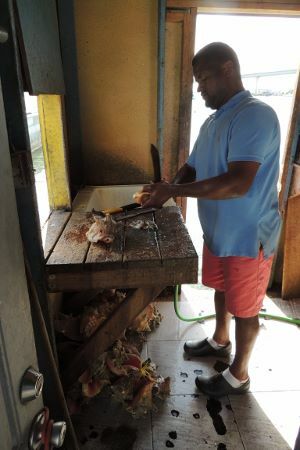 After his indictments from the US, Lehder began living in Columbia until he was captured by Colombian authorities and then extradited to the US. On May 19, 1988, Carlos Lehder was convicted and sentenced to life without parole plus 135 years. 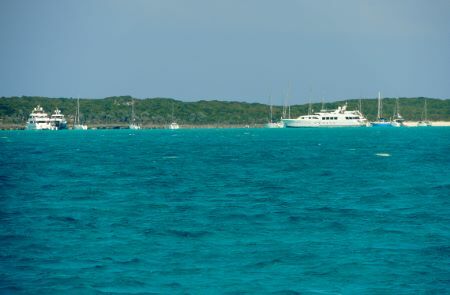 We sailed on after lunch heading towards Staniel Cay knowing we would pull over somewhere and anchor for the night. It was a fine sailing day too. Winds were 10-15 knots and perfect for me to get out my Spinnaker. For my newer readers, a Spinnaker is used in lighter winds and I acquired mine from a used sail place. I never saw it until it arrived and we like the brightly colored sail. I only get to fly it occasionally so it was best that I ordered a used one. 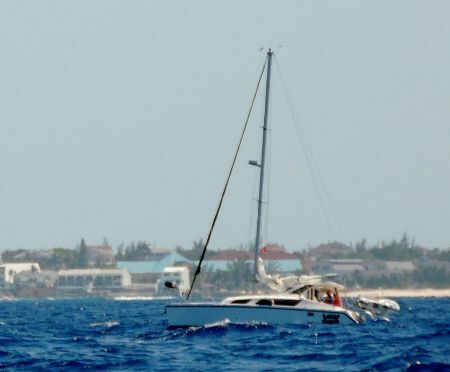 One problem is that it is more for almost downwind sailing and you can't point to the wind as well. It didn't matter since we weren't going anywhere really anyway. We flew it for several hours and then figured out what to do to meet up with the other two boats. We passed this little ship on the way down. Everyone needs a helicopter on the stern of the top deck of their boat. Don't you agree? Maybe they will fly into Normans for lunch! 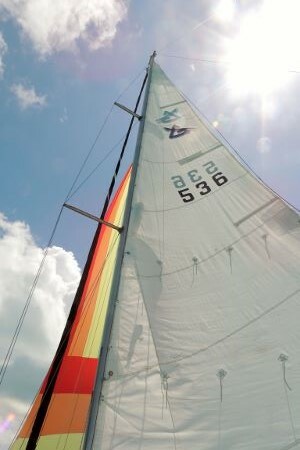 Just a picture of the Spinnaker. 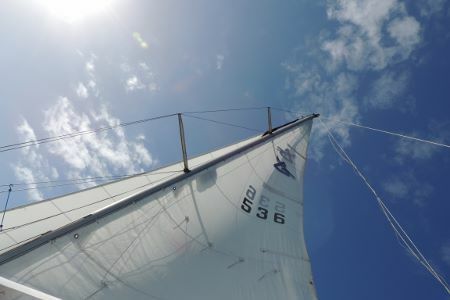 As I said, I do enjoy flying this sail even though it is a bit of work to set it up. 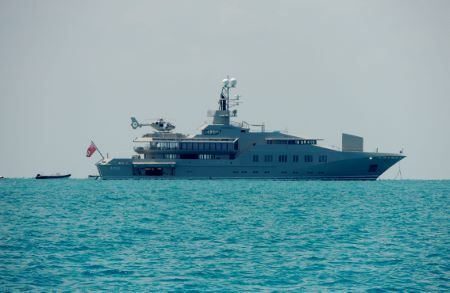 I threw in this picture not to tell you about big boats we are seeing. Instead, I put it in just in case any of my past students are reading this. Look at the bow of the boat and notice the Black Ball. My students should all remember that his is the day shape that is supposed to be displayed by an anchored boat during the daytime hours. Every professional captain of these larger vessels is displaying a black ball according to the ColRegs. I just thought I would reinforce that point. 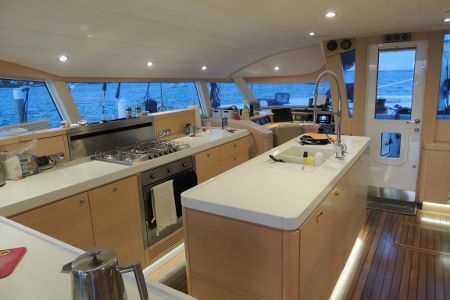 Now, another nice boat too! 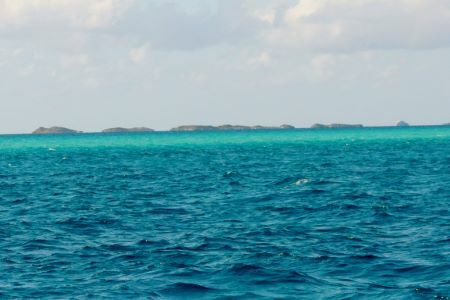 The waters in the Bahamas are traveled by visual cues as well as the charts. I am finding that my charts in my GPS have been off several times on this trip and they are only 3 years old. If we come over again, I will have to look into a better and more updated chip for the Bahamas. 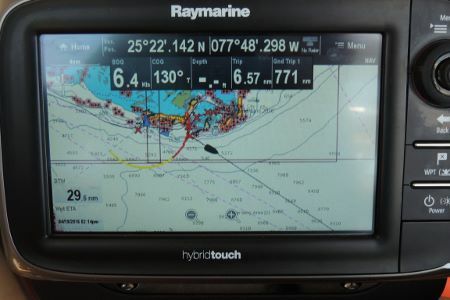 My Raymarine charts are only 3 years old but they simply are wrong more than my old Garmin charts were previously. The visual cues are the color of the water. You can see in this picture the darker blue water which is deep and the light blue green water which is shallower. How shallow, well that is the question. 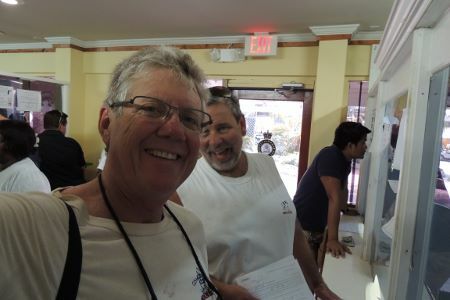 While I was at Allans Cay, I calibrated both of my depth finders to the water depth. I know they are correct now and it simply makes me feel better about the water I am traveling in. One was off by 6 inches which doesn't seem like much until the difference in that 6 inches means you hit bottom or not. We worked our way into an anchorage off of Warderick Wells. 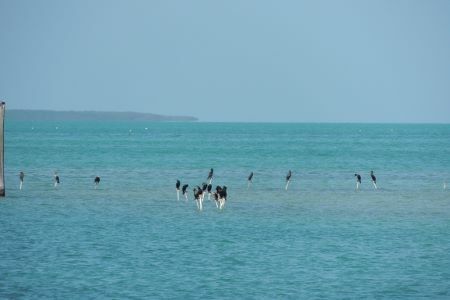 This is the home of the protected area for wildlife so no taking of fish here. I read that if you are caught fishing the fine is $500 per person on the boat not just the person/s fishing. 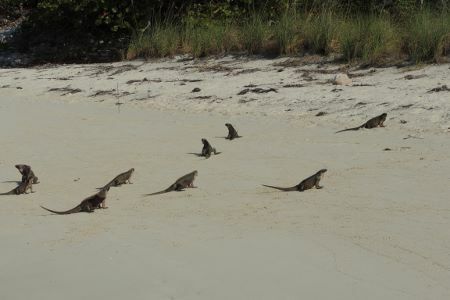 We will get out of the protected area later today probably because I believe we are headed for Staniel Cay next. April 26 - We, once again, will start with yesterday. 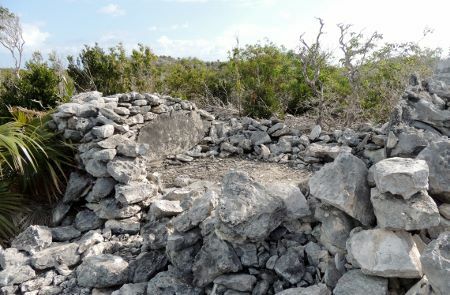 We had anchored at Warderick Wells and when we got up off we went for a walk to see the Ruins of the Davis family. As I understand it, this family was removed from the area by Priates and did not leave peacefully. 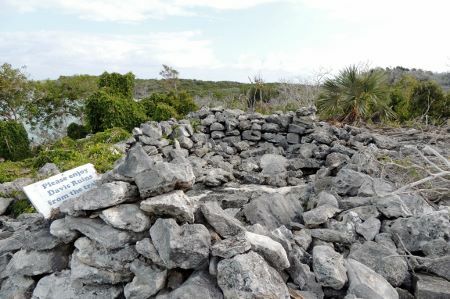 The ruins were rocks that created various structures. 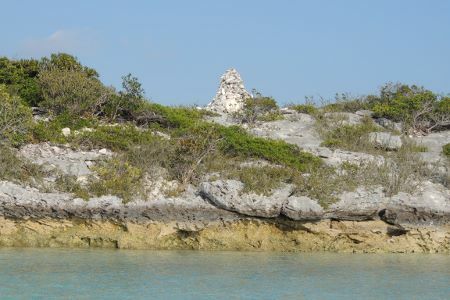 Evidently the Pirates wanted this area because it provided a good lookout along with a nice harbor for their vessels. Some said that the Pirates would come here and do "Pirate things." Don't you just wonder what kind of Pirate things they would do? I'll be some of it had to do with Rum and Treasures. Sorry, but I thought I had my Exumas book on board but did not. Otherwise I could give you a better history. 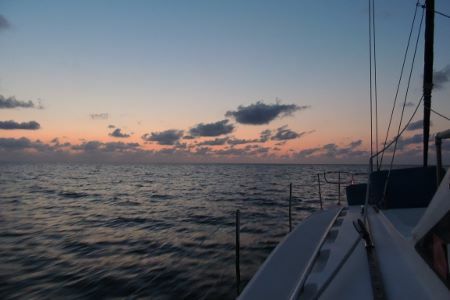 I will say that these waters are proving to once again make the passages to get over here worth every minute of it. 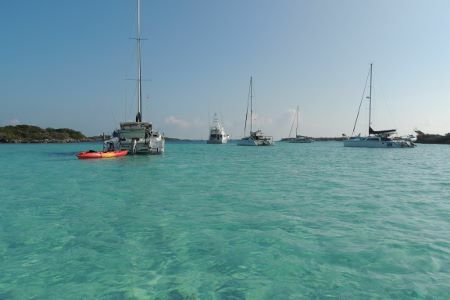 To me they are some of the most beautiful waters I have seen while on our boat! 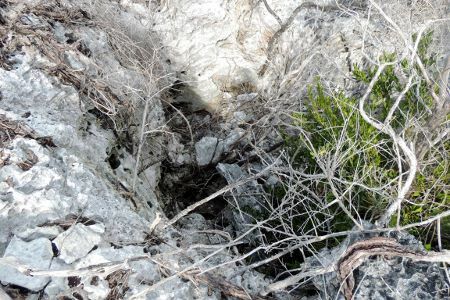 The pictures below are some of the ruins we walked. You can get an idea from the pictures how harsh of an island this really is. No earth to really grow food and it seems the only thing that does grow is scrub trees. Regardless, some called it home. 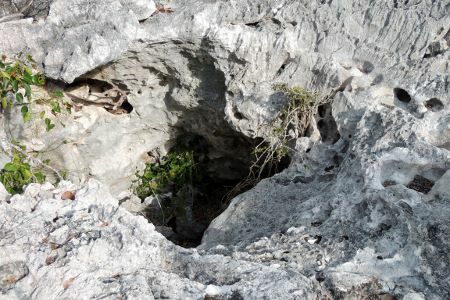 Below you can see some more holes that may have had a purpose or perhaps they were just holes which were created by erosion from the rain and storms. 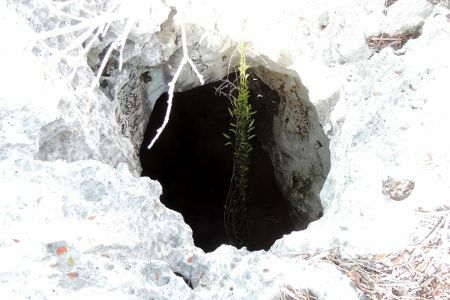 I wouldn't want to fall here! That said, a friend of ours - Pat - did fall here about 3 years ago and she died as a result. Those who are old readers of our website would remember Pat and Tom and their Gemini named Sun Cat. I had warned everyone to take good shoes and to be careful. Mike and Kim brought me back to my boat to do a couple of small boat projects then they took off by dinghy to visit the headquarters and walk another trail. They saw Boo Boo hill and the wonderful sites there. Bill and Sissy walked to the same hill via the paths but it was a long walk since the trails are sort of marked but then again, not to well. The picture to the right gives you a view of the northern part of Warderick Wells. Our boats look nice anchored together and once everyone was back on a Park Ranger came by and let us know we were not in a designated anchorage. We were too far in. Oops. We were leaving anyway but I apologized as I was hauling the anchor. Evidently we are supposed to be further out unless we take a mooring ball. I should have brought that book! 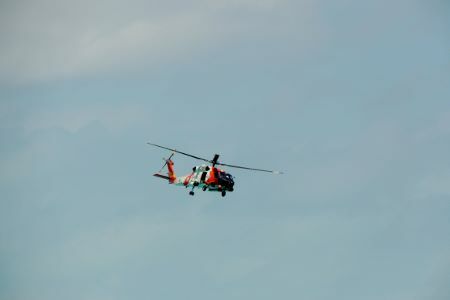 We always see a Coast Guard flyover when in this area. I don't know what they are doing exactly but I suspect they are taking video/photos of the vessels to see if any are doing smuggling or ???? Regardless of their purpose, I am licensed as a Merchant Mariner by the Coast Guard. So doing my best Captain looking stuff, I waved and then saluted them as they flew by. 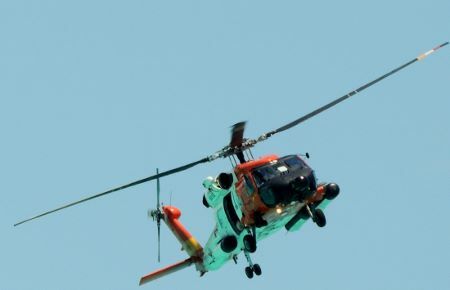 I truly respect the people of the Coast Guard for their multiple mission role. One of them impacts me directly which is I know they would be there if I ever have to call Mayday. 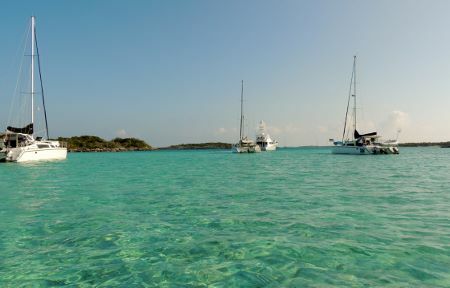 We had and absolutely WONDERFUL sail down to Staniel Cay. Winds were almost perfect and we sailed at about 50 degrees apparent wind. It was so perfect that we saw speeds ranging from 6.5 to 7.5 knots (this would be above 8 mph as an average) for our highest speed. We averaged above 6 knots for the entire time we sailed. The waters ranged from a dark blue to a light blue and blue green. Simply beautiful and the seas were about 2 feet. 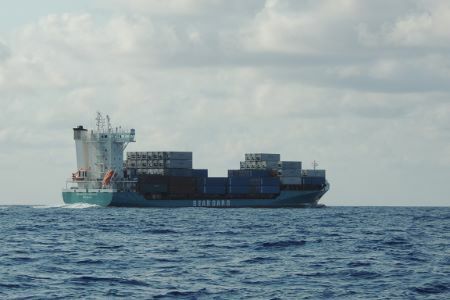 I saw the vessel over to our port and then looked up his AIS information on my Chart plotter which receives the AIS data from my Matrix VHF Radio. I saw he was a 161 foot vessel with a 36 foot beam and the name was "Like a Rose." So I did what everybody might do admiring a beautiful sailing vessel. I called him on channel 16. Guess what, he answered and there really was no reason for him not to. I moved him up one to 17 to get our conversation off of the hailing and distress channel. I then told him what a beautiful vessel she was and asked him what was the height of his mast. 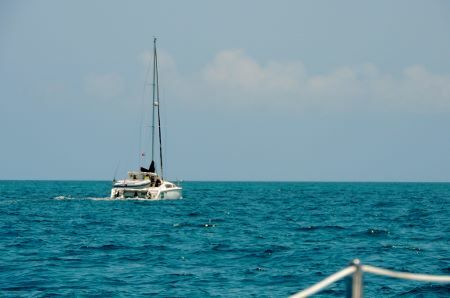 You are going to have to wait for it...... As a Ketch rig, the masts are typically smaller than a sloop rig. 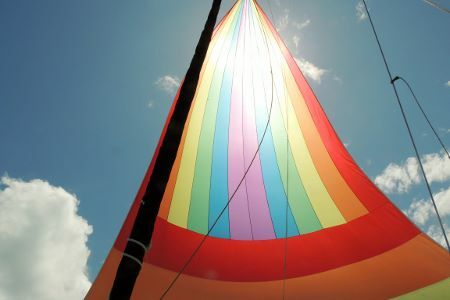 This makes the sails easier to handle and it also allows you to really balance the sails for a wonderful easy ride. Well, you've waited long enough - the main mast was 165 feet high. No misunderstanding 165 feet high. Believe me, nobody is going out with a hand winch and winching up the sail! 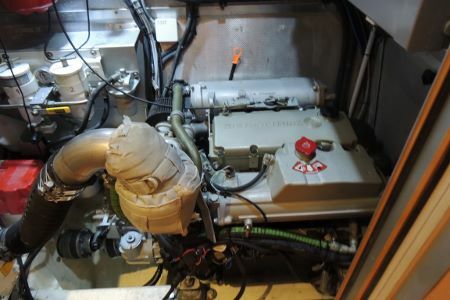 Everything on the vessel is controlled with either electric or hydraulic winches. Push button control. 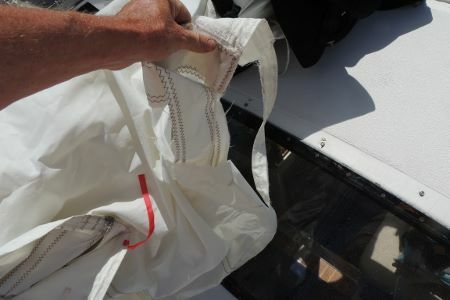 If you have to ask how much a new sail is, you shouldn't own the boat! 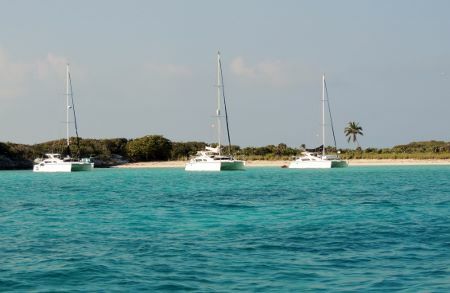 There are lots of boats anchored at Sabine Cay! This is a toy everyone really needs. 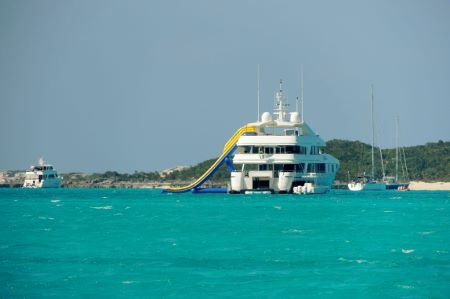 A slide from the top deck of their boat. I'm just trying to figure out two things. 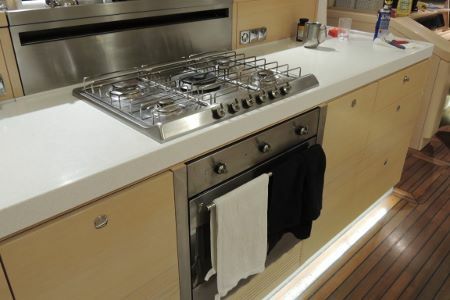 First, where to store it on our boat and how to make our top deck higher so it would be just as much fun. 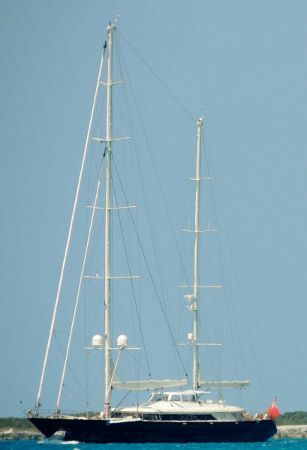 Perhaps we should rig a lift to the top of our mast - perhaps that is an idea - nope. I was first in so I chose to answer by the Thunderball Grotto entrance. This is the same underwater structure that was used in the 007 movie Thunderball. I really need to watch that again when I get home. The picture to the right is off our stern and to the starboard side. 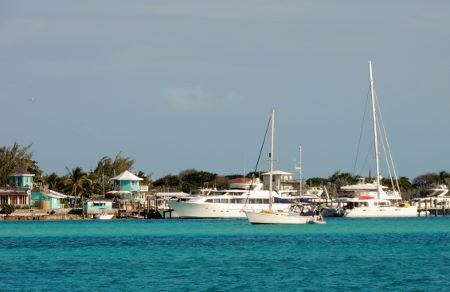 It is a picture of Staniel Cay Yacht Club. We will be over there later today so I can take Deb to lunch again plus post these website updates. I understand it is now $10 per day to use the wi-fi. I need to post my updates and I also need to check on some online students so I will pay the $10. 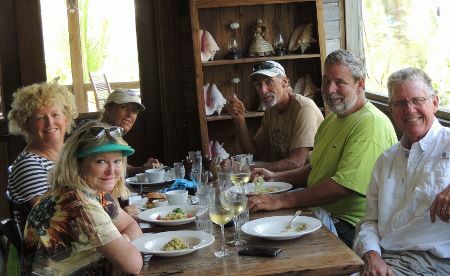 Last night we all gathered again for a meal of Mahi Mahi which this time we grilled. It was very good again and the sides were delicious too. You can't beat community meals with good friends and good food! 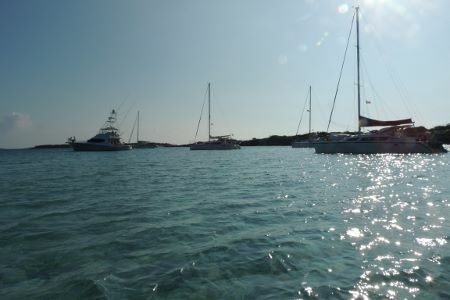 We will probably leave later this afternoon for a lazy sail starting back up the Exumas. 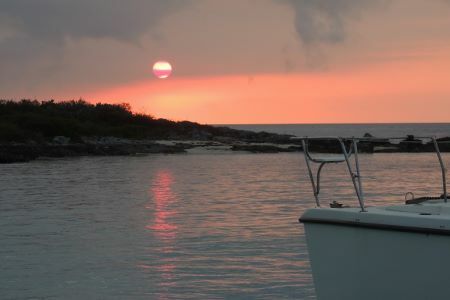 Bill and Sissy have a daughter, husband, and very young child flying in at Marsh Harbor in the Abacos. 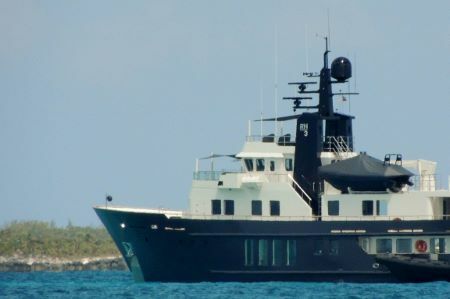 We have a week to get up to Spanish Wells and then make the crossing to the Abacos so they can run up and get them on the 6th. We are all hoping for a good crossing along with weather that allows them to meet their schedule. I honestly don't know when I will get to update the site again. It will probably be in Spanish Wells but again, I just don't know. If you are wondering where we are, the link on the first page should get you a map showing our position. I will post it again here just for you. Otherwise if you are a friend of mine on Facebook then you will get an update as I send out the Spot signal every day or for a crossing even more often. 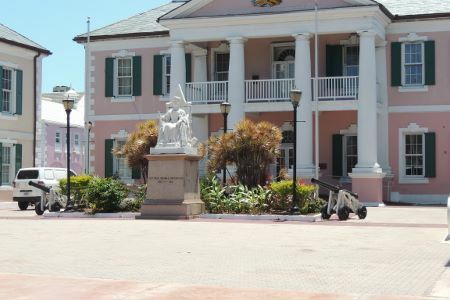 April 22 - All things must come to an end and we have made the best of Nassau. Today will be our last day at Nassau Harbor Club. Before I get into our next plans, let me bring you up-to-date about yesterday. Really a down day. I had promised Deb I would go with her to the Straw Market. Nobody really makes straw items anymore but the name held. Since she isn't walking very long ways yet, we decided to either take a cab or a bus. She recruited some more people for the trip so we stood outside trying to get a cab until finally we just picked up a - wait for it..... - number 11 bus. Really, we did. I could see my life flashing again through my head but this driver turned out not to be Mario Andretti. Instead, he drove a bus like a bus. Must be a new guy! Still, our stop was at the end of the run so the ladies got to see some of the area we walked the day before for parts. 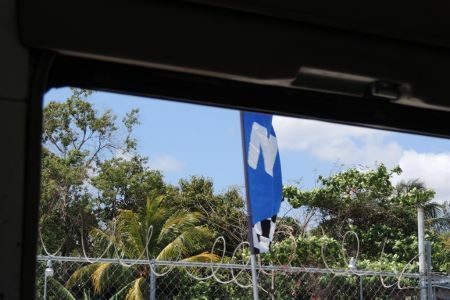 Through the window, I did get a picture of the razor wire on one of the many locations. 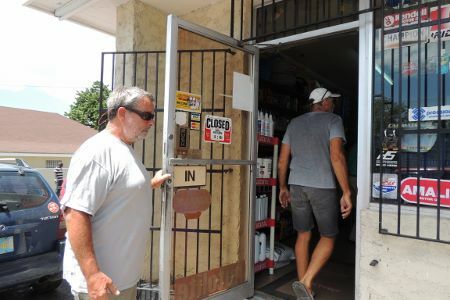 Mike figured that a razor wire door to door salesman came through the area selling the benefits of razor wire. 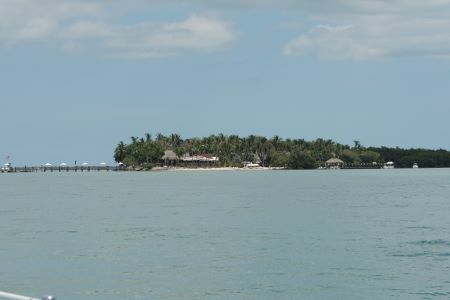 Made a bundle and retired at one of the out islands never to be seen again. 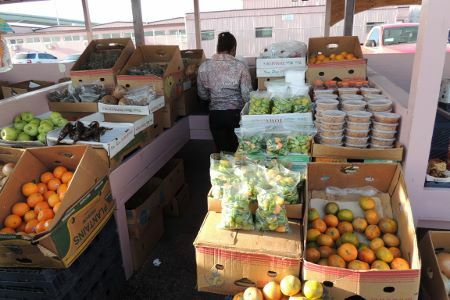 We made it to the market but it was different. It wasn't in the old building. Evidently, someone burned the old building down and they relocated it to another structure. We also agreed to all split up because group shopping never works out. Besides, only Deb wanted to shop anyway. 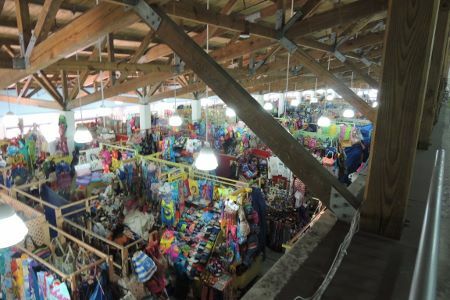 The first thing that hits me when I walk up to a place like this is: All this junk is the same junk you can find in any tourist trap at any port in the world. It just has different names of countries on it. (Ok, I'm a bit jaded with my shopping opinions!) The second thing that I am immediately reminded of is the gorilla marketing and high pressure sales. People sit around by the restrooms and the entries saying "Are you Shopping today?" Seems like a nice question to which you are probably going to say "Yes." (Me I say no, I'm looking for my lost wife who left her purse and has no money.) After you say "Yes" they say "let me show you my shop." At which time you are expected to follow them through the rows of the same junk and then look lovingly at their fine goods (junk) and listen to them about how much you just have to have this refrigerator magnet or candle holder. To say this isn't my deal is an understatement. Deb however sees it at a game and loves to bargain. Trust me she should have left me at a marine supply store. We are being escorted to a ladies "shop" when Deb sees a covered bowl at a different ladies shop. 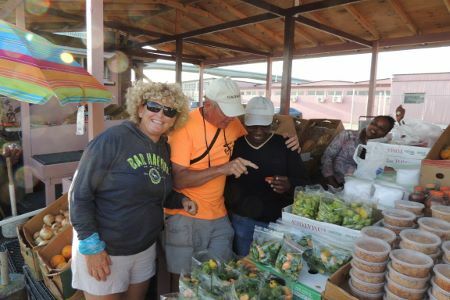 Deb stops to ask how much. The lady says $20, then says "how much will you pay?" Deb says "$10" The first lady who thought she had exclusive right to us began pressuring us to continue to her shop. The second lady leaned over and said "How about $15?" 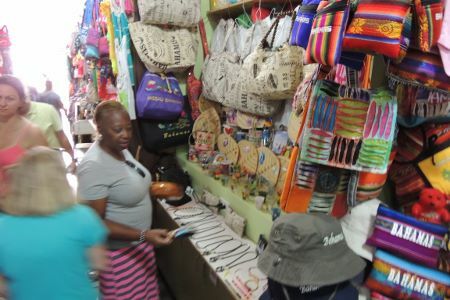 Deb ultimately agreed but the first lady took the bowl and us to her shop and started showing us her fine stuff. Ok, I'll quit calling it junk. Deb asked "Jim, do you have $5. I looked and didn't only a 10 so that meant the lady with the fine stuff would have to break the 10. She kept pushing the kitchen magnets, candle holder, and other fine stuff because she was now holding $20. Deb said, "that is all I want." More high pressure sales. Finally I was done. I told her either $15 or $0 - make your choice. Another attempt at a sale and I very nicely said - last time - $15 or $0 - looked at Deb and Deb knew this was it. The lady gave us the $5 and the bowl and we left. Next time, Deb better leave me at that marine store. 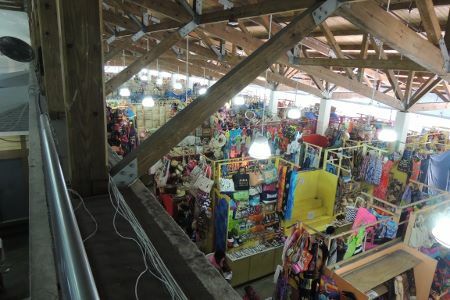 I wondered off and got some pictures which you see below of all the fine "stuff" in the straw market. There wasn't a sign saying don't go up the stairs for the overview pictures so up the stairs I went. No high pressure sales and I'm happy. Deb actually did a little more shopping and we headed over to Hard Rock for a break. 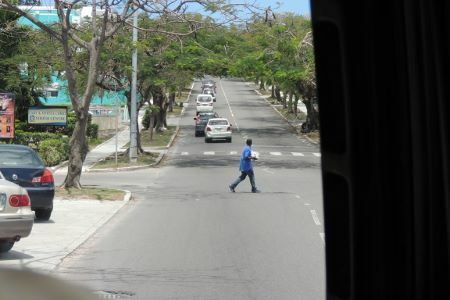 Then we were walking on to the bus stop to head us back home. This is a picture of the government building which you would have also seen in our 2008 pictures but I realize most of the people who followed us then are not the ones looking at the site today. If only we could go over and fire the cannons! Back on the bus. This guy was actually training for Nascar but had not yet gotten his full capabilities. Overall, not hard to drive 2 miles in a straight direction. We spent the afternoon pretty much being lazy. 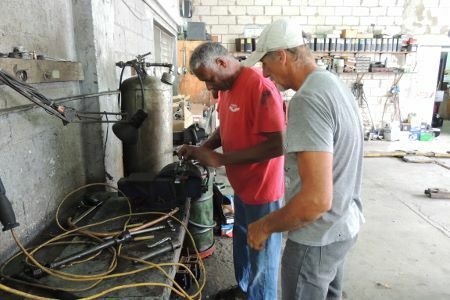 About all the projects are finished and we are really ready to get out of here but the winds are still blowing right from the point we want to go. 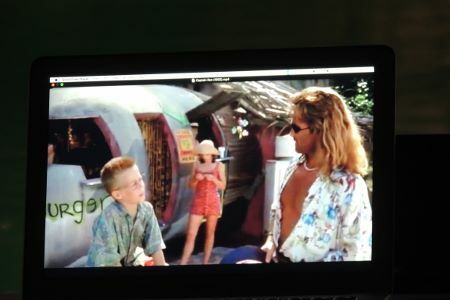 The decision of what was going to happen for the evening was made and it was a Captain Ron party - in other words, watch Captain Ron and see if Bill and Sissy can actually quote every word of the movie. Well, the rest of us are getting pretty good at it too! 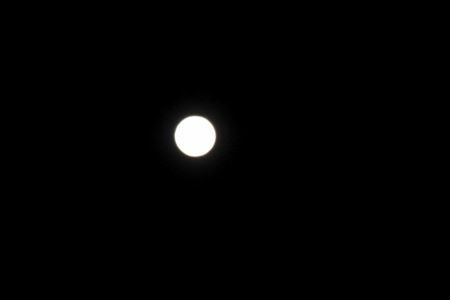 The full moon was very nice. One of the best parts of it though was a surprise - Mike and Kim had pre-cooked Ribs and he brought up a grill and reheated them. They were some of the best ribs I have tasted. The key, according to Kim was twofold. First, wrap them in a foil pack with ginger ale in it and second was cook them at 225 degrees for 4 hours. Then bring them out and onto a grill to add the BBQ sauce. Excellent was all I could say. It was a lot of fun sitting over on the lounge chairs watching a movie on a small laptop computer screen about 15 feet away. It reminded me of the days when all you had (this shows my age) was a small black and white TV and everyone sat in the living room watching this TV that you had to get up to rotate a dial and change the channel. It was more fun than watching it all on a big screen TV with picture in picture so you can keep up with 2 or so programs at one time. 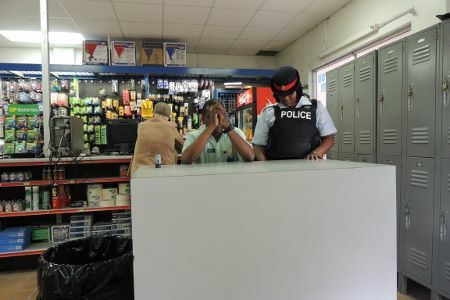 The community of talk coupled with a movie everyone has seen before was simply a good end to our Nassau times. Now to today. 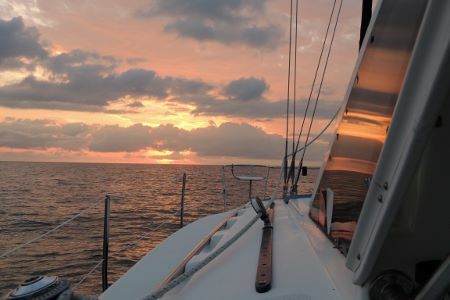 We are going to hang out as long as they let us and then go out and anchor to await the wind shift tomorrow morning. 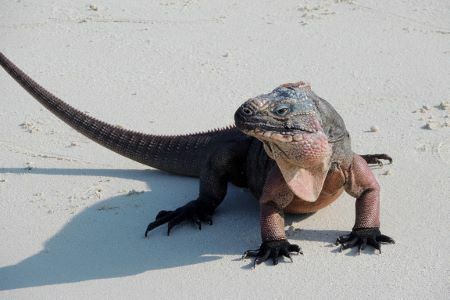 Our goal is to get over to Allen's Cay which is home of the Iguanas and the first experience Mile Marker and Pisces will have of the northern exumas. Jim's Spot Location - I like this idea so much I also added the location link to our first page. Now to see if it all works. April 21 - A big day today! Welcome back. 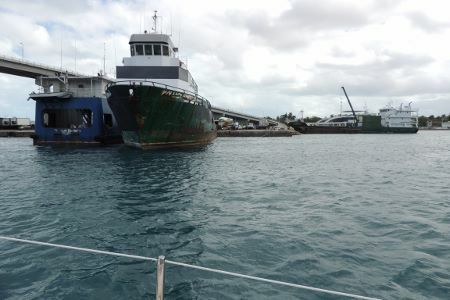 Here you can see Freedom and Pisces in their berth. The wind was picking up so according to plan we stayed here in order to get some things fixed on the Mile Marker. Before I outline the day, I need to make a correction. Yesterday I said it was about 7 feet between the waterline and the bottom of the boom. That was incorrect. It is actually 8 feet or so. That means those swells were at least 8 feet and probably higher since you can't catch a picture at an exact time. Now we are calling the swells at the end of the day 8-10 feet. Definitely a rough day. Back to the story! 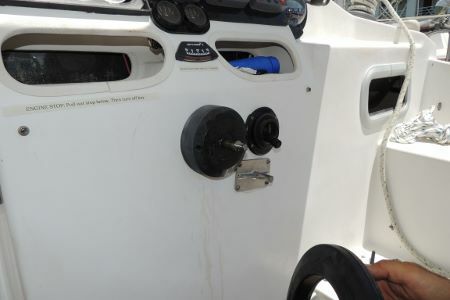 Mile Marker's autohelm (the thing that drives the boat automatically in one direction by just pushing buttons) was not working. So far they have driven by hand the entire way which is how it was done for years and years but is tiring when you just have 2 people on board. Our project today was to get the autohelm wheel drive off and see if we could fix it. We had already tried to get the wheel off but it was stuck hard to the shaft. So we needed a wheel puller. 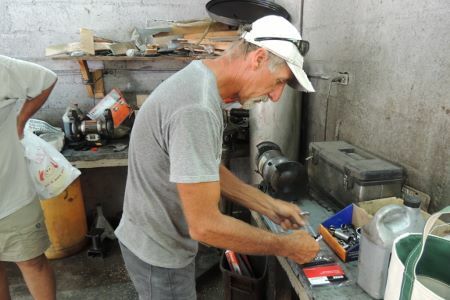 Mike had asked around and none close by so we were in for a short (so we thought) hike to a parts store to see if we could get a wheel puller. The main mode of transportation for us is walking. Not bad exercise but then again, this wasn't to be too long of a trip so off we go. 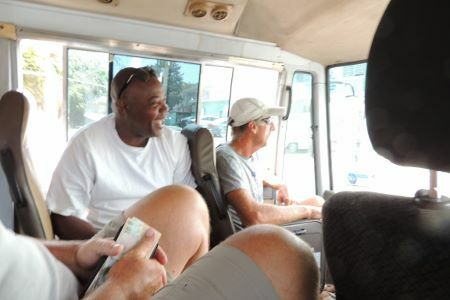 What we learned was a block to a Bahamian is not the same as a block to us!! 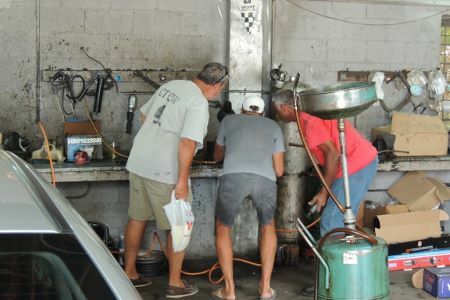 We hit a few marine parts stores on the way but no wheel pullers. Passing the Regal again, Bill just had to get behind the wheel again. Nothing like memories! We finally arrived at an auto parts store but to do so we walked "over the hill." Let me tell you that every time we have been in Nassau we were advised, go where you want here by the water but DON'T go over the hill. Now we are venturing into uncharted areas. We found the parts store and in we go. You have to take a number to get service and I wasn't sure if everyone was there to get a part or to shoot the bull with friends. 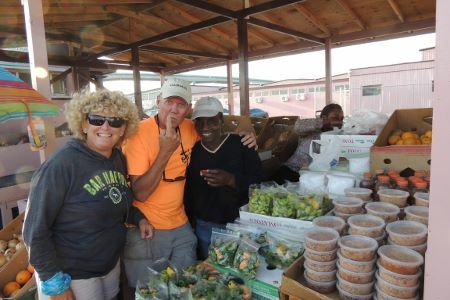 Once again, the Bahamian people were great to us. While waiting we found out about the best hardware store where we could get some cutters and grinding items if we needed them. Once the part was in hand, we were sure the puller was too big so it would need to be ground down. The lady behind the counter said, "My brother works in the shop out back, he will let you use the grinder. I'll go back and tell him and meet you our front and take you to him." She did exactly that and out came the new puller from the package and instantly plans were made to make it into the right size. 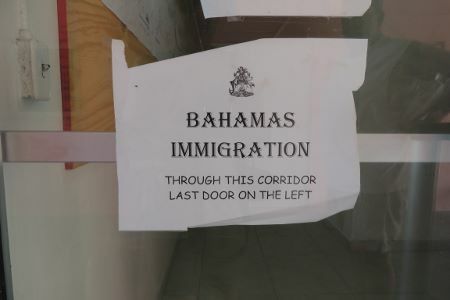 Once again, the nice Bahamian people came out. The guy in the red shirt came over - he was her brother - and said, "just tell me what you are trying to do and I can probably do it quicker." 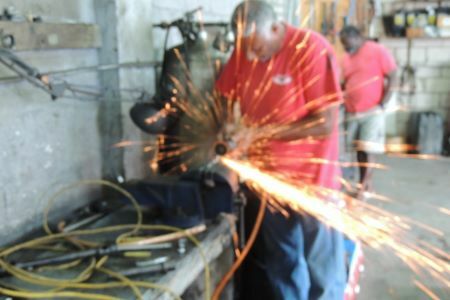 Bill explained and he got an air grinder/cutoff wheel and off he went. He modified each of the 3 jaws just like we wanted. I know it was just like we wanted because it got inspected!!! I think it helps if you bend your knees when inspecting! Next we began another short walk of a couple of blocks (about a mile and a half) to the hardware store. There we found the right tools of destruction should we need to make a bigger mess of that new puller. Mike paid up and then got inspected by the guy with the police lady before we could leave the store. I guess their inventory control system is very good and they have a problem with shop lifting because everything is practically locked down. Again, we went Over the Hill! To get back, Mike paid for the bus ride back. Let me just say this about the bus ride. 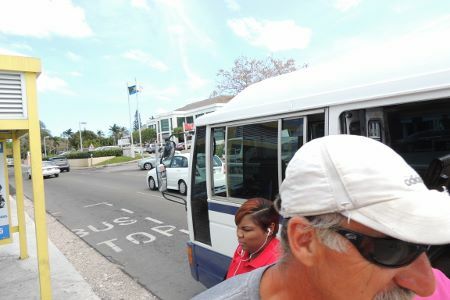 If you go to amusement parks and enjoy the rides that scare you a bit, you should go to the Bahamas and ride the #11 bus! 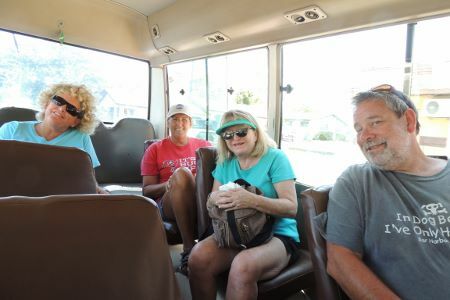 Once we got off the bus we pretty much agreed the ride over on our boats in the 8-10 foot swells with 3 foot waves was nothing compared to the bus ride. 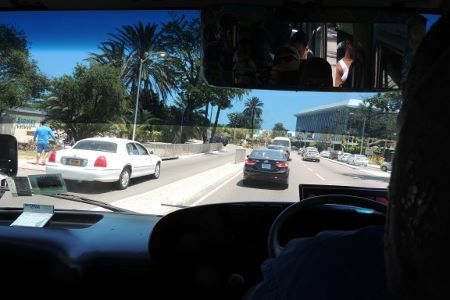 On the bus, if you ignore the almost traffic accidents, it was an experience. Back we headed and noticed as people got off the bus that some paid the 1.25 fare and some paid $1 and one or two just got off without paying. One especially probably was drinking and smoking a little too much of the home grown tall grass. I've included a couple of pictures of the other side of the hill since you probably won't go there. I didn't catch a picture of the many places with razor wire around them and on the roofs. I knew we were getting closer to "our side of the hill" when we saw the hill coming up in the front window. 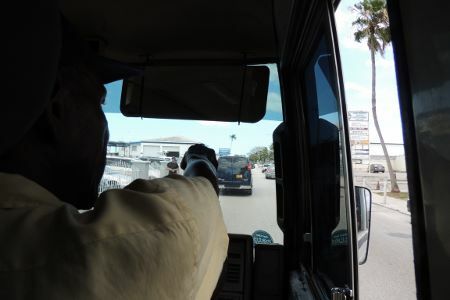 The driver would yell out the window every now and then - "Do you want to race?" I think this is their version of road rage. We were off the bus and next step was to see if the new modified puller would work correctly. Bill was on the project and guess what? The modifications seem to be correct without using the newly acquired implements of destruction. 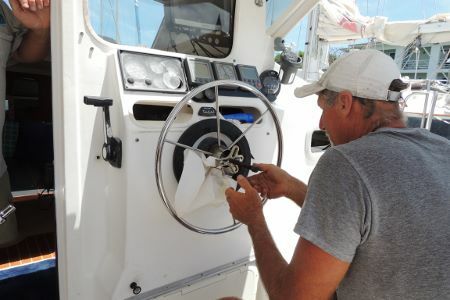 To pull the wheel normally, you simply have to apply some outward pressure and hit the nut, which you have unscrewed to the end of the bolt, with a hammer. However, if it was on so tight or corroded too much then you have no choice but to get a puller, tighten it down very tightly and then hit that with a hammer. We used my 3 pound hammer as the hammer of choice. It took several times of tighten the puller and hit, tighten the puller and hit, before the wheel popped off. Next was to disassemble the wheel drive and see what we could see. In my old drive, I had to replace a number of supports which had broken along with the belt. In Mikes drive the supports were redesigned and were better. They weren't broken so luckily Bill had an old belt on his boat that was better than the one on Mikes drive. That along with adjusting the tensioner properly, again with makeshift tools from our boxes, it certainly looked like it would work. Testing proved it would! Mike is a happy camper and Kim is really happy. We believe the Autohelm will now work again for them. 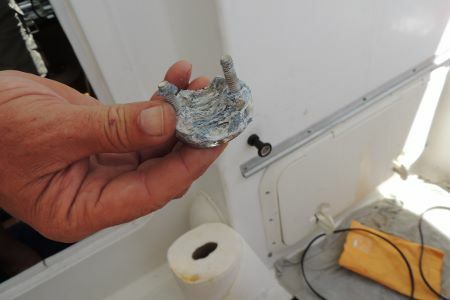 Mike showed us the corroded fishing rod holder part that broke on the way over the Bahama Bank. They had a fish on but the wind had come up so the left it on. Then a bigger fish hit the smaller fish, drag was slipping then Bang! The rod holder broke off going along with the rod and new Penn Senator reel. If anyone catches a fish with a rod and reel connected to it, keep the fish but let us know where to get the reel! Next on to another project. You remember in my last post I showed a picture of the sail that had ripped. 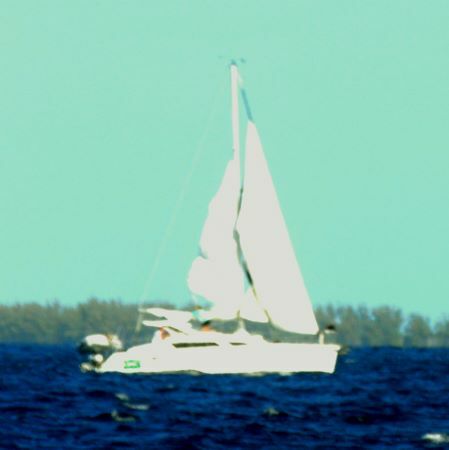 Unfortunately it was above the 2nd reef so the sail was not useable. The main sail has a very good purpose besides providing free energy. (Then again, it may not be free if you have to fix ripped sails!) 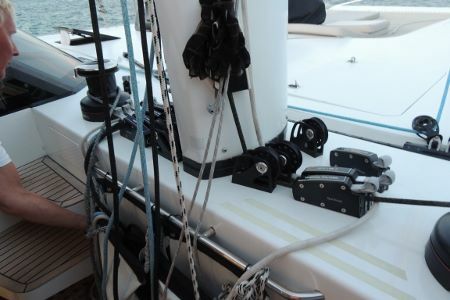 The sail also acts like a big shock absorber and helps slow the pitching of the boat side to side. 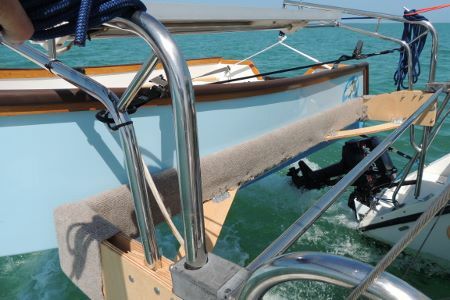 Fixing the sail may seem like a bit of a waste but in the end it should be a better ride. Now to find out if we can get it fixed. After looking at the sail and measuring the rip, we were off to a sail maker. 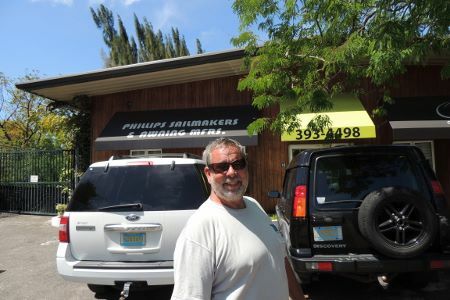 What we found was Phillips Sailmakers and canvas shop. Peter here at the marina told us about them. After we talked to Larry, the owner, he said he would fit the sail repair in. Yes! So back to the boat and guess what, Larry's wife even drove us back. 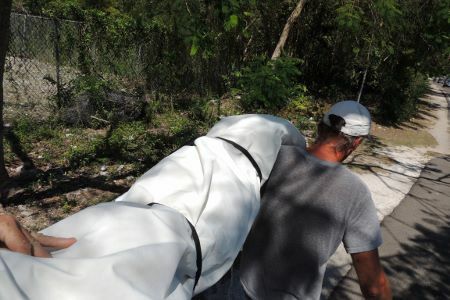 We stripped the sail off and bundled it up then off to Phillips Sailmakers. 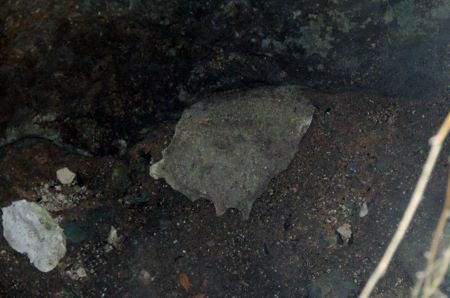 Bill and I carried the sail over for him to take a closer look at it. He said he could fix it and would try to get on it the next morning. Probably about 3 hours work plus patching materials. 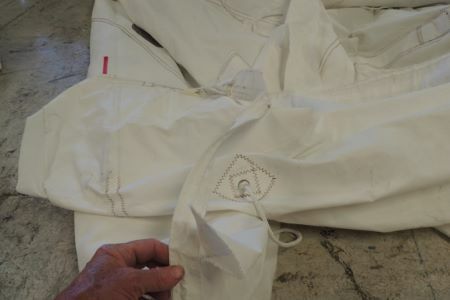 While there I asked Larry about the possibility of making 3 sails since Bills was ripped, Mikes was ripped, and mine was sure to rip at almost any time. They are all 20 years old. He then told me something that made me completely confident about recommending his services to anyone. 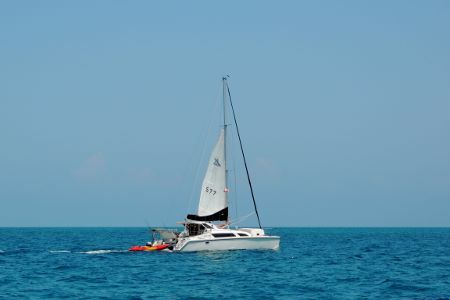 He said, you are going to be heading back to the states and you can probably get a sail for 15-20 percent less there. We would have to make the sail and ship it to you. That would be on top of our added expenses to get the material to Nassau. 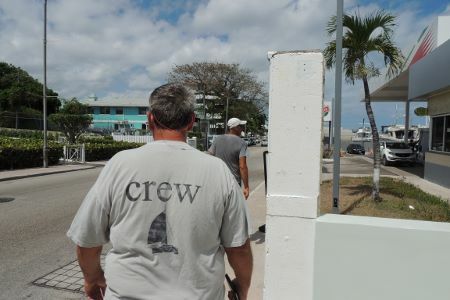 Folks Larry sure seems like a "stand up" guy so if you have any issues with your sails or need other canvas work done and you need it done in the Bahamas. 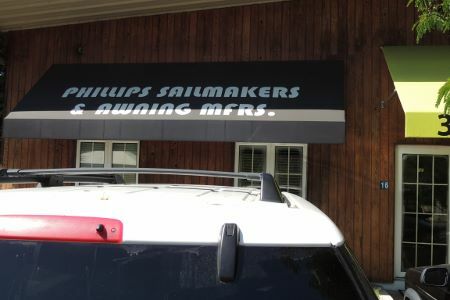 Call on Phillips Sailmakers. By the way, they were just finishing up all the sails for the boats down at the Georgetown regatta. They made 11 sails for them. Projects came to a stop so next it was off to find some local food. I had told everyone about Skinny's under the bridge. 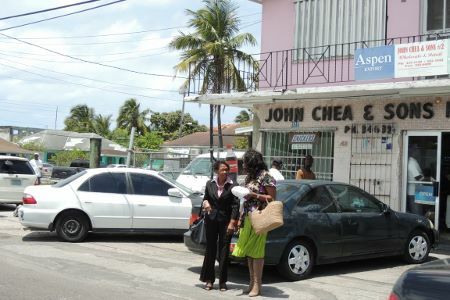 I thought it was some of the best Conch salad going. So we were off to the bridge to see if Skinny's is open. Deb is still getting over getting sick so she stopped off at The Poop Deck instead of walking the entire way. 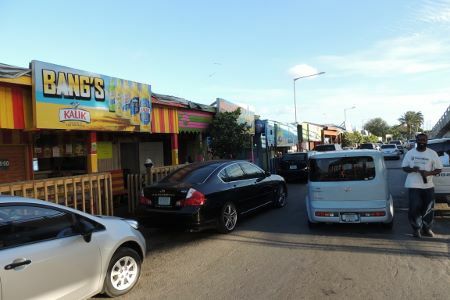 We then found Skinny's was open. 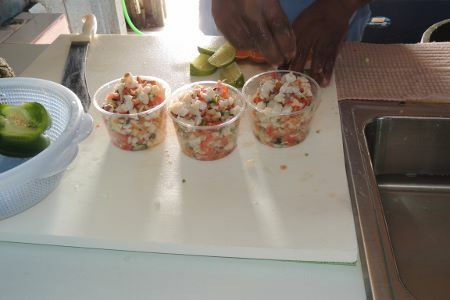 What you see below is the process of making Conch Salad. 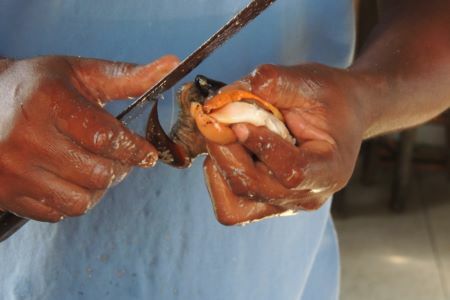 First you have to get a Conch, knock a hole in the upper ring of the shell and then cut the muscle that attaches the muscle to the shell. 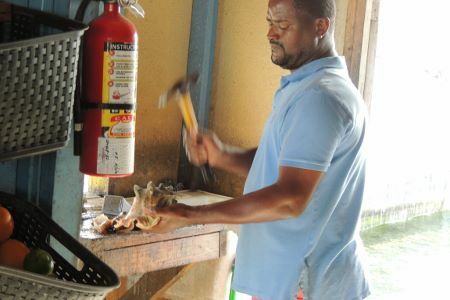 Once you get the Conch out, you have to skin the Conch. Clean it up then wash it good. 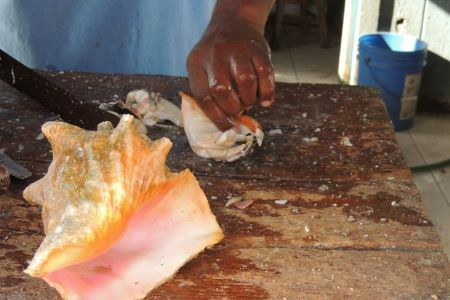 Cut the Conch in fine slices and add this to chopped onion, green pepper, tomatoes, and a Goat Pepper. 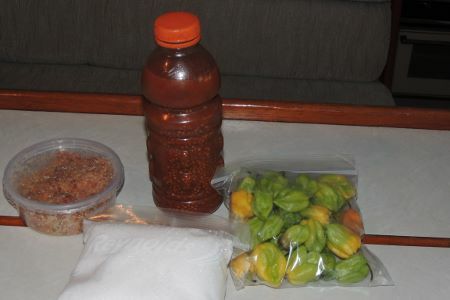 Yes, they call them Goat Peppers in the Bahamas but in the states we call them Ghost Peppers. Same thing. You then add the lime and orange juice and it "cooks" in the acid. Excellent! I ate one tub myself while Bill and Sissy, Mike and Kim both split a tub each. You can get an idea of the "flavor" of the area in the pictures below. Charlie sold them their meals and I just enjoyed watching. This was good food too. I even got to be in a picture. Something rare since I'm usually the one behind the camera. Next came another wonderful part of the day. I wanted some Goat Peppers so we headed further under the bridge area to the market. We came upon this stall and I got a number of items. If it was something I had not seen before, it was time to taste and buy. She had this jar of peppers, spices and added to that lime juice. It was hot but not too hot and it was good! I just had to have a jar. Plus, I needed some sea salt from the Ragged Islands along with a mixture of sea salt and red peppers and of course my Goat Peppers. Below you can see Mike with his newest best friend. The pictures below that are as I was walking back out of the area heading back to pick up Deb. I got Deb and found a new "Short Bus" for the Shores Bar and Grill. 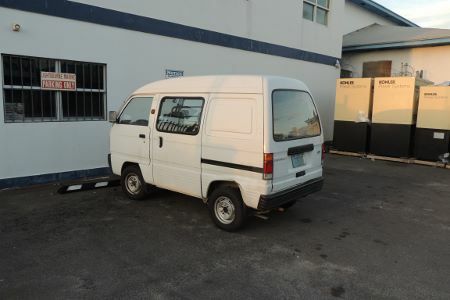 Looks to be a perfect replacement for their short bus. Ok, hope you enjoy that John! Next, there is a boat across from ours. A bit bigger. 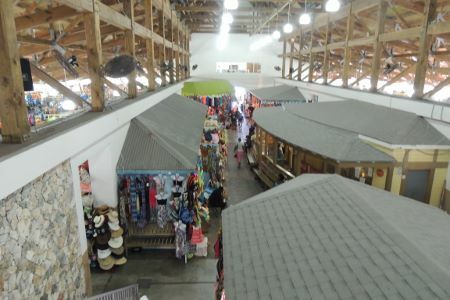 60 feet long and 30 feet wide. I talked Henry into getting on it for a Pauper tour. Enjoy the pictures. 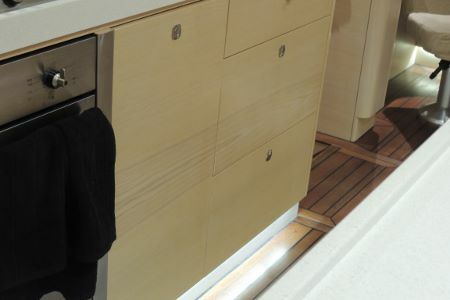 Everything is custom including the deck cleats which recess into the boat when not in use! This is the Captain - Henry. Not a bad galley either. 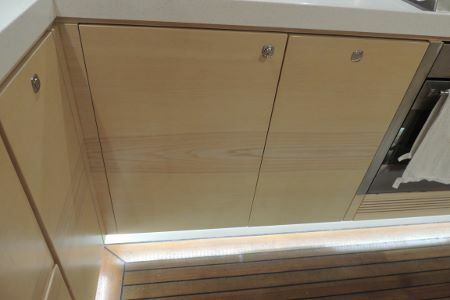 The wood for the cabinets is matched grain. Very very impressive in the attention to detail! April 20 - Welcome back my friends! 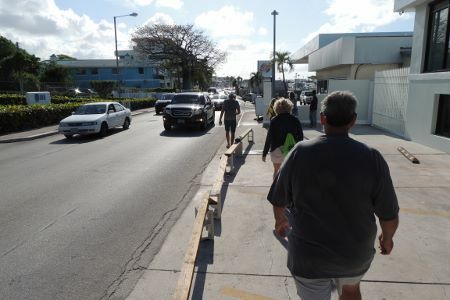 We made it to Nassau - that is the short story but you know I will tell you more and with pictures! We left yesterday morning at the appointed time of 8 am. I had listened to Chris Parker (Weather Guy on Short wave) and he confirmed the previous forecasts which was wind out of the NE at about 15 or so knots (18 or so mph). The winds were to drop some during the days to 12 or so knots. That isn't a bad forecast and the winds weren't directly on our nose so the trip was still on. We left the anchorage and everyone got under sail expecting a lively day of sailing and no engines for a change. With those winds, the seas should be about 3 feet or so and that is very doable in a Gemini. The forecast we didn't get was for swells which of course are caused not by the wind we have but by the wind much further offshore. I took this picture of the GPS just after we saw 7 knots on the speed (SOG) box which is in the upper left corner. You can also see that at this time we had 29.6 nm (about 34 miles) to go to Nassau. As everyone was starting to get used to the seas - we also had a 3-4 foot swell in addition to the 3 foot seas - then things started to happen! I realize this picture stinks of the MIle Marker but it's the only one that was worth a darn. Believe me, when you have a problem on a boat nobody wants to wait for someone else to get a camera adjusted correctly. What was the problem? 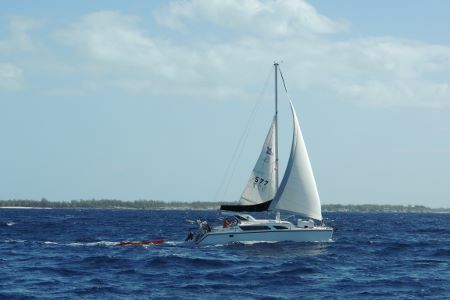 Look at the main sail (that is the one at the back of the boat.) That sail has a rip in it which you can see. It looks like a dark spot at the trailing edge of the sail. That isn't supposed to be there! 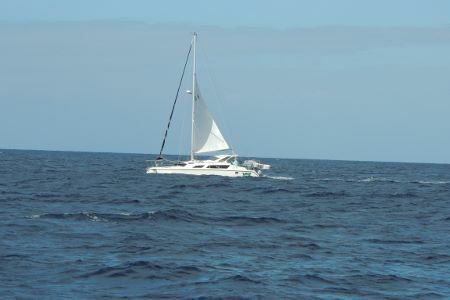 Bill on Pisces had already ripped his sail earlier on the trip and now it seems there are 2 Gemini's that need new sails. Mine is the only main sail left standing. SInce we have the same vintage boats, it looks like we may be shopping for a 3 sail package deal from someone. That wasn't their only problem. 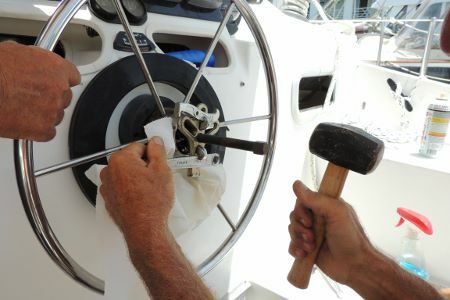 It seemed the roller furler (the thing that rolls in and out the forward sail) had also jammed. 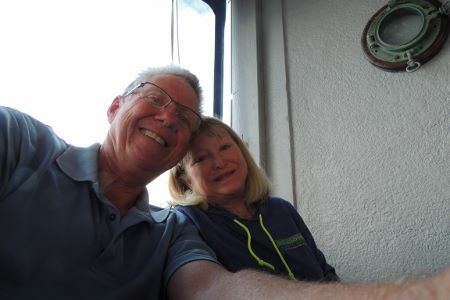 Mike and Kim did an excellent job getting down the main sail and then getting the roller furler to work again. So they then turned toward Nassau under motor alone. We asked, twice, if they were ok with going on and both times it was yes. 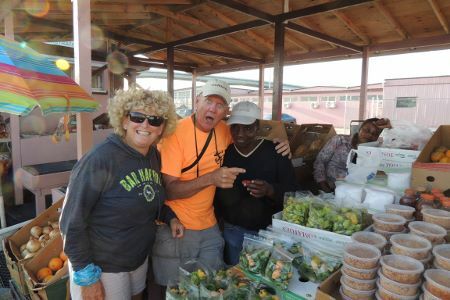 Probably the added pressure of being stuck in Chub Cay for a week was what made them say yes but we moved on forward. Let me digress in the story a bit. Anyone can handle one problem at a time. That is easy. 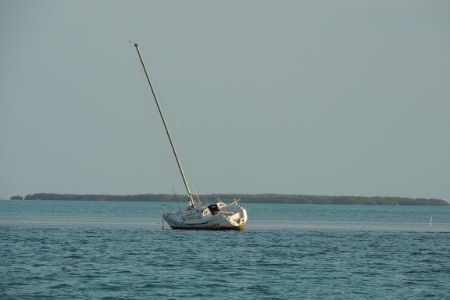 When boats get into real trouble is when they have 2 and 3 problems at a time and are short handed. Priorities have to be set and nobody really knows how they will react until they face it. That is why education and training are so important! Try to work through some of these issues before they happen. I have written about the seas and photography before. The camera tends to flatten everything out. The two pictures below were taken to demonstrate this entire concept. You can see Mile Marker in the left picture and they look to be right on the top of a fairly flat surface. Anyone of you would say, not a bad day to go sailing! Then look at the picture to the right take about 3 minutes or so after the first picture. It looks like they have or are sinking on that fairly flat surface. Guess what, they aren't! Instead they are down in a swell which we can now estimate the size of the swells. 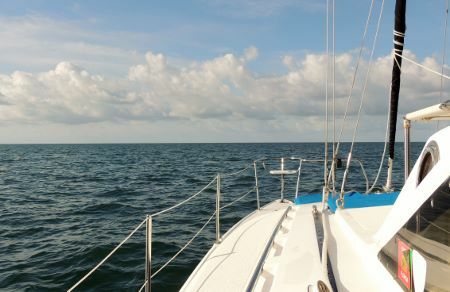 From the water level on the boats to the bottom of the boom (the horizontal pole running backwards you hold the bottom of the sail down with) it is about 7 or so feet between the two points. Since you can just see parts of that boom, it means the swell is about 7 feet at this point. That wasn't even the biggest one we saw that day. So what does it all mean. 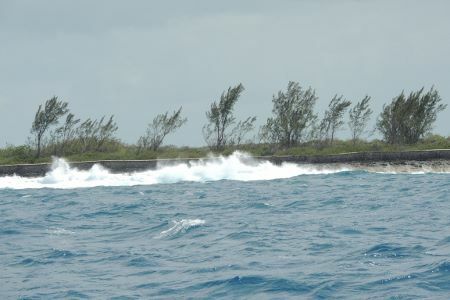 On this day the swells were fairly close together - about 5 seconds apart - which made the seas much worse for us. IF they would have been 10 seconds apart then it would have been a fine day of sailing with the exact same winds. Let me just say this wasn't a fun day to get to Nassau. Regardless, we are almost there and we aren't going anywhere for the next few days! 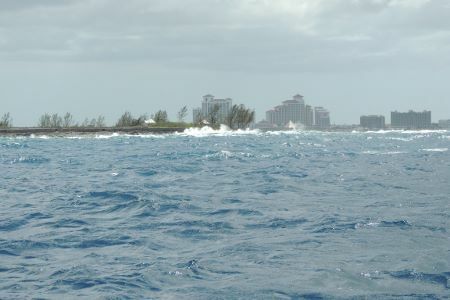 It is hard to miss Nassau. From about 15 miles offshore you can see the first building start to show up. 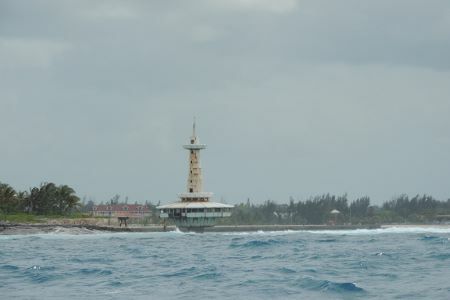 This is a major hotel on the island and we heard it was sold to the Chinese. 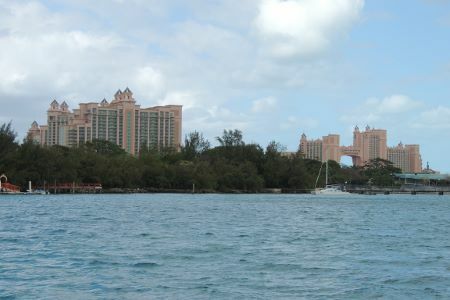 After that building you can start to see the buildings of Atlantis on Paradise Island. You can see the waves were crashing and we were heading into the inlet with an incoming tide. That was the good news because if it would have been worse conditions if the tide were heading out. To our port side (left) you can see the light house standing on the point. Once we were inside then everything calmed down and all sails were taken down. 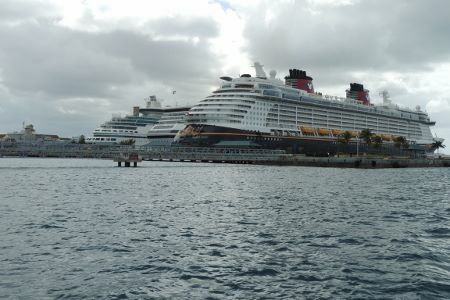 We also figured out very quickly that we weren't in "Kansas Anymore" since we were looking at 3 cruise ships from 3 different cruise lines. The pilot vessel you see in the lower right is the boat that goes out and puts a "Pilot" onto the large ships coming into the harbor. 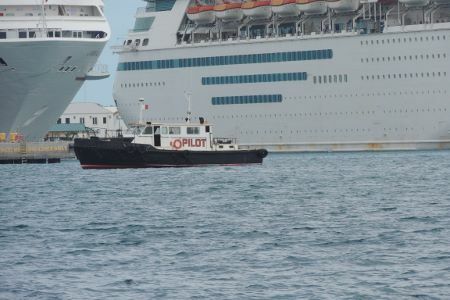 This pilot works with the crew to ensure nobody hits anything or runs aground. They also go pick them up off the boat when it leaves. In good weather the pilot has little to do. However, in bad weather the pilot can make the difference between a safe passage or an accident. 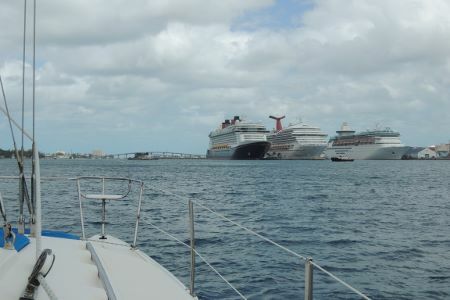 This picture gives you a better perspective with the cruise ships on the right and the bridges heading over to Paradise Island which is home of Atlantis. Then below you can see the cruise ship terminal along with all the trappings that are now in every port for cruise ship passengers. 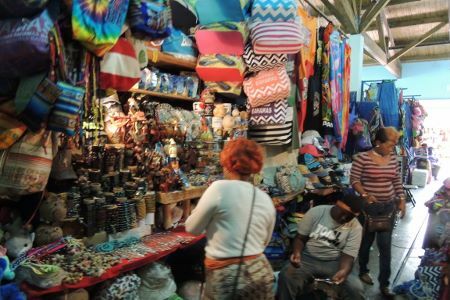 Everyone wants a souvenir but unfortunately they all seem to be the same in every port today just the name on the item changes. We pass by Atlantis on our way to pass under the bridges and to the marina that we stopped at. We did all make it and decided to head for dinner after securing the boats. Mike and Kim on Mile Marker on the right. 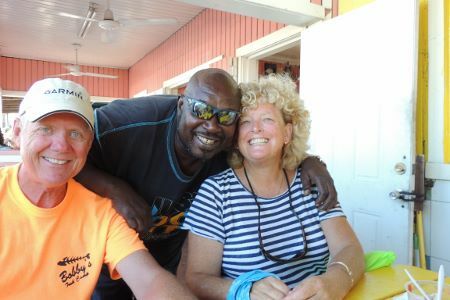 Lower is Bill (Sissy decided to stay at the boat - hopefully not packing to leave after that crossing), and Deb and I. 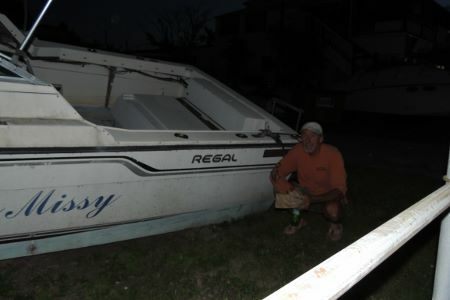 On the way back Bill saw this boat and it was a Regal which happened to be a Royal version. Just like his old boat. Evidently in the day, they put many a lobster into a boat just like this one except their boat ran! So what is next. We all need to do some laundry, pick up fresh veggies, fix a few items - it's a boat and boats break that is what keeps the economy alive. 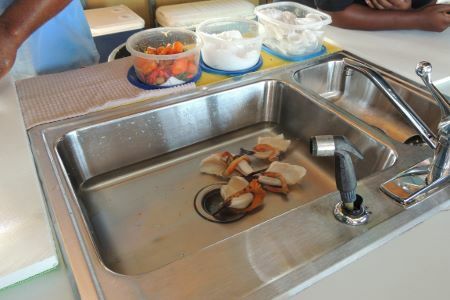 I also need to rinse the salt off the boat along with take on water and fuel for the next part of our adventure. 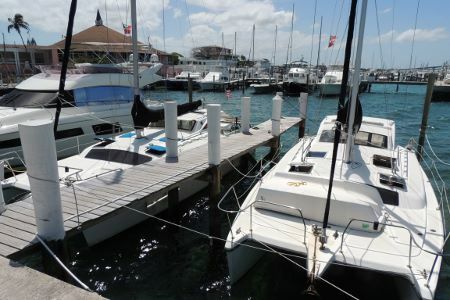 We will probably stay at the marina another night then go out and anchor until Saturday or Sunday. 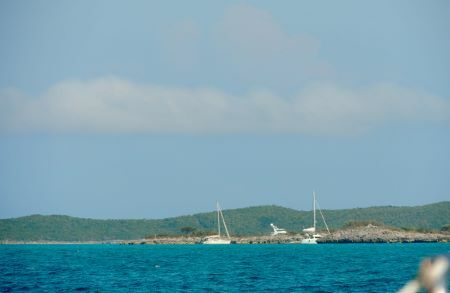 Allen's Cay (pronounced Key) is about 35 or so nautical miles away so we really need a nice day or we may have mutinies. Winds are supposed to be moderate today building tomorrow right out of the east which is where we are going. They won't change direction until Saturday noon at this point which means we just have to do what we do - keep an eye on the weather and get some things fixed. 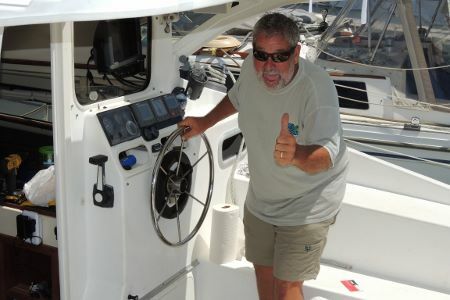 Overall, Mike is in need of an Autohelm repair, Sail assessment (can it be fixed right away or is it toast). Me on the other hand, I'm starting to remember how to do this website. 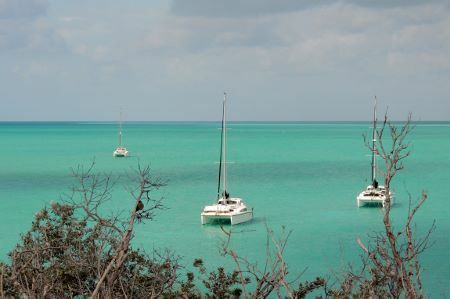 Until later - I hope you send us nicer weather for sailing! April 17, 2016 - I actually feel I am back at the beginning of my learning curve. Between poor internet service and simply the lack of memory of my entire file structure - it is fairly simple but then again I'm just getting to be an old web guy - I feel I am starting all over again. April 17 - Welcome back to my "water world." Yes, it has been a long time since my last update on this website. Sorry Rick and anyone else who just happens to still check. So shock shock shock. Seems Facebook has taken over for posts like this. That said, many people aren't on Facebook and I still get comments from people about the website. So, quickly, let me tell you what is up. This year, we decided to go with a minimal group to the Bahamas. That may sound selfish and it probably is. I had so much work to do on our boat that I simply could not do it all and organize another trip with a bunch of boats following us around. 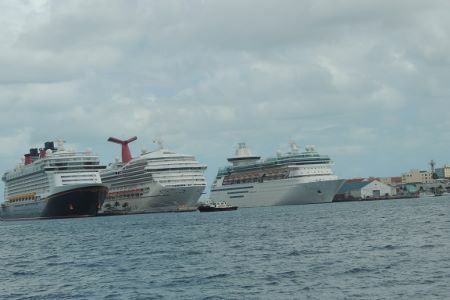 So, we talked to our close friends - Bill and Sissy along with Mike and Kim (Bob was already booked for another transatlantic crossing) and these three boats make up the "flotilla." Install new fuel tanks to hold a total of 50 gallons of diesel up from 35 gal. And these are just the major projects we completed. The hardest was the design and build of the dinghy with second place being the davits. 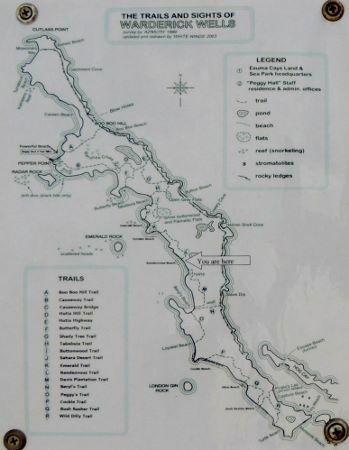 Of course I also inspected 5 different Grand Banks for a past student who was using my services to eliminate and select a good boat to survey before he made an offer. 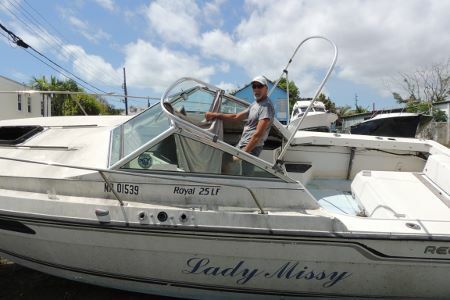 We found just the boat about a week before I was scheduled to leave and he will soon be the proud owner of a 46 foot Grand Banks. Vintage (1990) but a very beautiful boat and very well cared for. 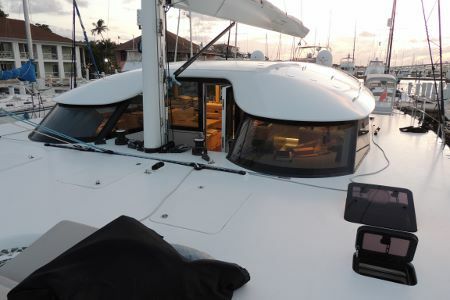 These inspections involved a number of trips, chartered plane flight, and finally a road trop to Fort Lauderdale where we found his Boat! We left on April 4th and just went about 4 hours to simply make sure the darn thing would make it. There we met up with Bill and Sissy and departed the next morning for Marco, then into the Everglades, and finally down to the Keys where we met back up with Mike and Kim. Boat projects were the name of the day/s and we got most of them done. Then we were off to Lorillies for an anchorage and meal out. Also a lesson to learn where the shallow water is too. 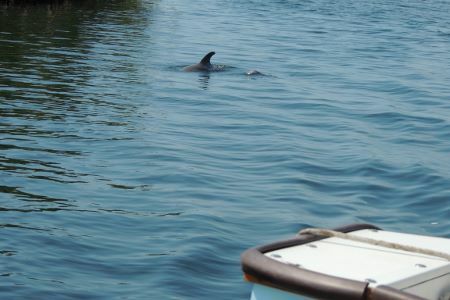 Dolphins are running around everywhere. Nice to be back out! Great time leaving the next morning for Fuel and positioning for the crossing. It has seemed that all the wind is against us so far on the trip but it really doesn't matter. We are now here and can wait. 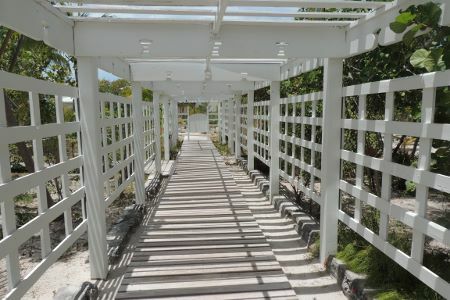 We crossed over to Bimini and this was our first time to check in there. It was easy but you have to take a slip to check in just in case they want to inspect your boat. Seems the price is 20 bucks to stop and check in or about 50 to just stay the night. We elected to stay the night and good thing too. We had a few more things to fix on boats along with wanting to get off and walk around. 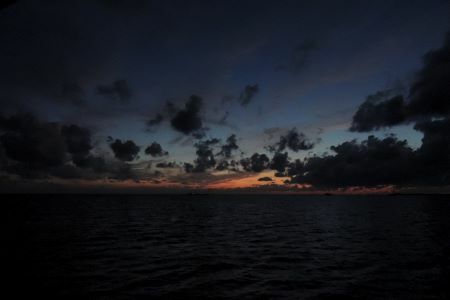 The top picture was as the sun came up looking at the Gulf Stream. The next picture is one of many ships we got close and personal with. We had to clear Customs along with Imagration. The picture here was one I took before finding out I wasn't supposed to take pictures in the office. Oops. After spending a night we left the next morning. 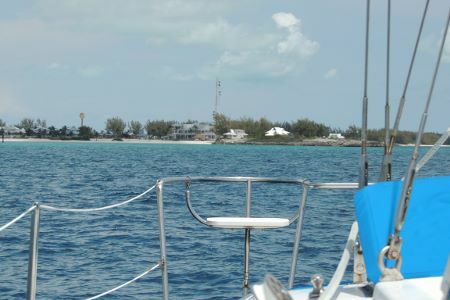 If we didn't get out and make it over 1/2 way across the Bahamas Bank, we could be stuck for a week in Bimini. 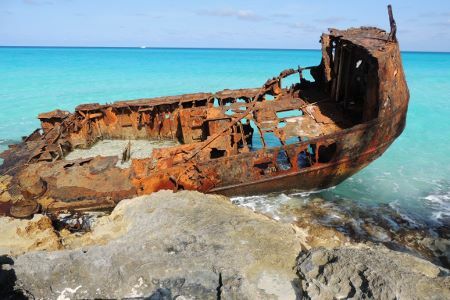 That wouldn't necessarily be bad but we really wanted to get into the heart of the Bahamas where the snorkeling and sailing would be better. So off we went. Pounding about half the way. Squalls came up and we were heading into 18-20 knot winds (23 mph or so) but that passed - sort of - and we anchored on the bank. 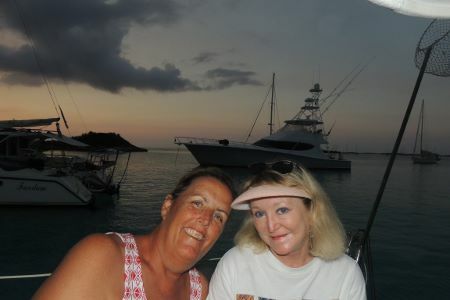 Not a very good night sleep but we were off the next day at 6 am and headed to Chub Cay (pronounced Key) where we would anchor and see if they were as unfriendly as the guidebooks seem to make them. 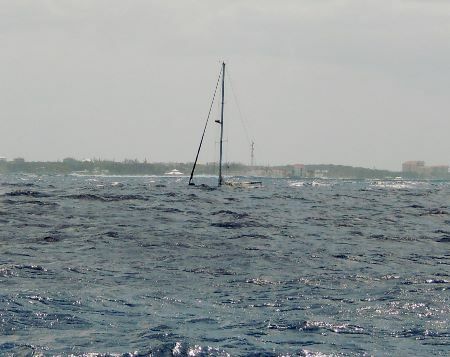 One of the wrecks at Bimini - Steel returning to Mother Ocean. The answer was no! 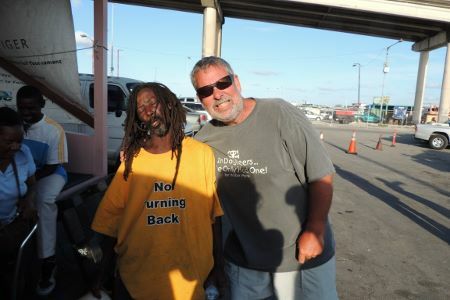 Mike has a way of making easy friends and talking to people. 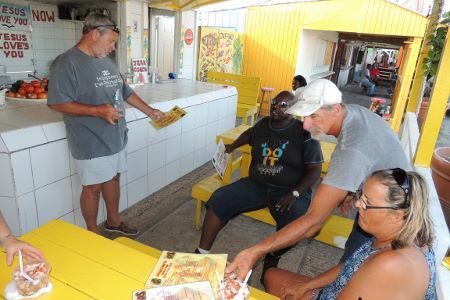 He met a Captain of a 100 or so foot boat who liked them and all of a sudden we had the inside scoop of the best locals (workers) bar along with some wifi codes which was great because the weather forecast had completely changed. It also let Sissy get caught up with her posts. Bottom line is we had a great time. We were there early and found this little bar had a pool table. So, Kim and I played then Mike and Kim and finally it was my turn again and a local came in and wanted to play. Pool there is free so it was about to turn into a fun night for me. I ended up playing about everyone in the place and winning all the games until the end when I was ready to go. In came a guy who normally plays with just one hand but this time he chose to play me with two hands. I lost and got my wish to leave. By the way, the STRONG margaritas probably helped him win too. Overall a fun night. Probably won't happen again while I'm in the Bahamas. Well, if this post actually works then I will be much better at updating when we have the opportunity to do so.